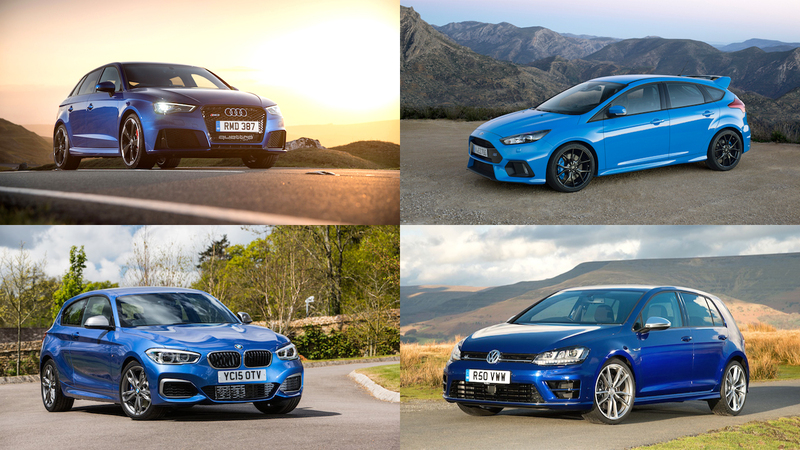 We’ve covered a lot of bases in these reviews, from a £2,000 Skoda to a £200,000 Porsche. 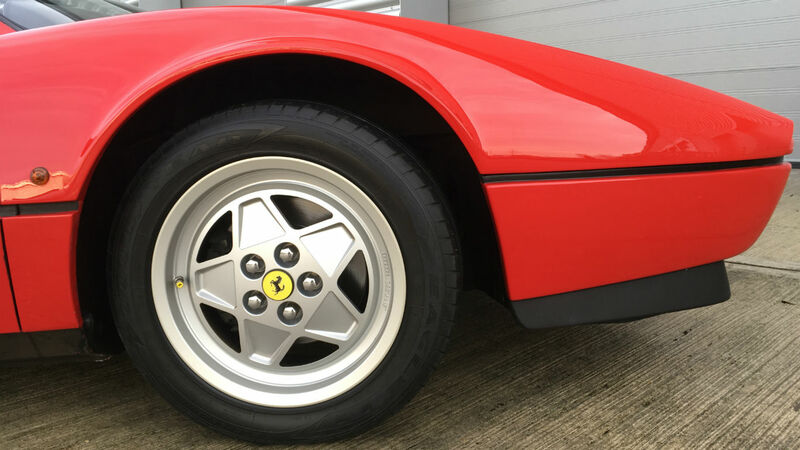 But we’ve never driven a classic Ferrari… until now. Welcome to the Retro Road Test Christmas special. 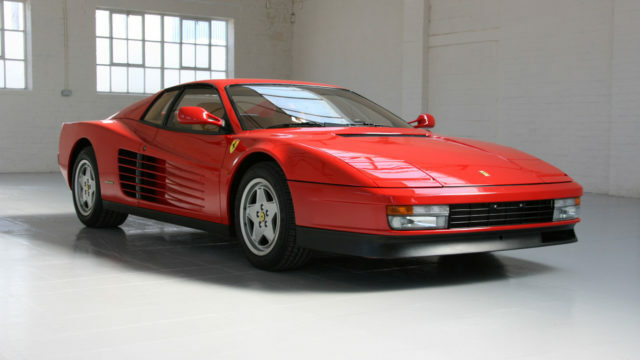 The prancing horse in question is a 328: the entry-point to Ferrari’s mid-1980s range, alongside the Mondial, Testarossa, 412 and – latterly – F40. Thirty years on, it remains one of the most beautiful ‘modern’ Ferraris – and potentially one of the most sensible, too. 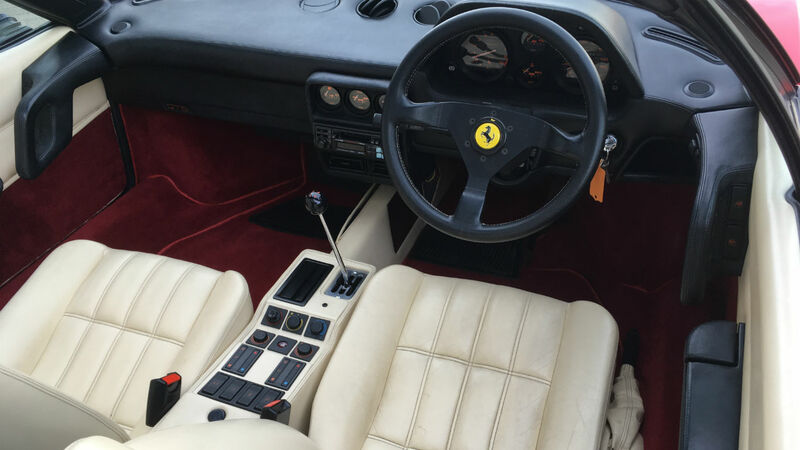 This 1988 328 is a targa-topped GTS (Gran Turismo Spider), kindly loaned to us by GVE London. It’s for sale at GVE’s Uxbridge showroom, priced at £129,900. 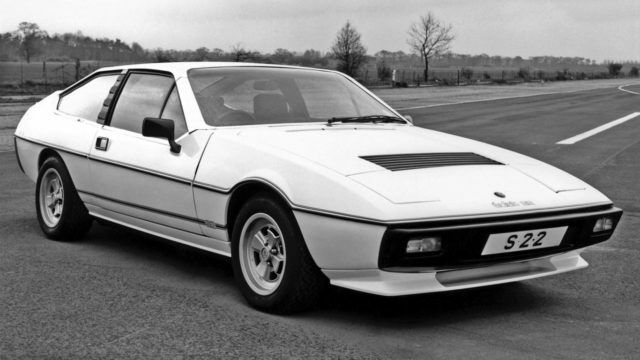 If you were shopping for a new Ferrari 488 GTB, you might also look at the Aston Martin V12 Vantage, Audi R8, Lamborghini Huracan, Noble M600, McLaren 650S, Mercedes-AMG GT S or Porsche 911 Turbo S.
Back in 1988, supercar buyers weren’t so spoilt for choice. 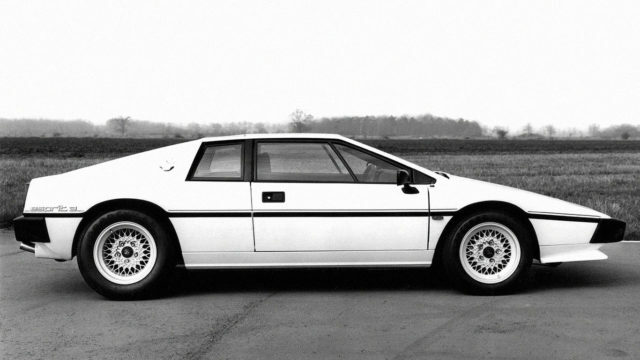 The 328 had just three rivals: the Lamborghini Jalpa, Lotus Esprit and Porsche 930 Turbo. 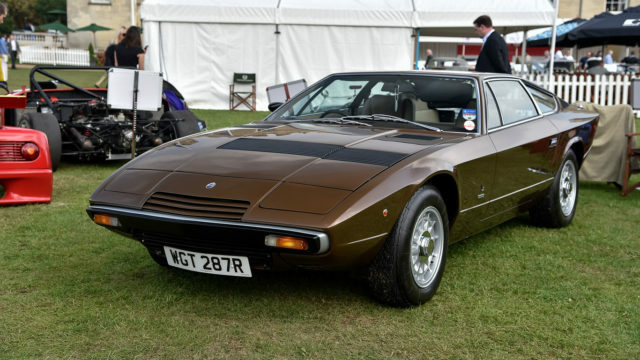 Oh, and the De Tomaso Pantera, if you really must. 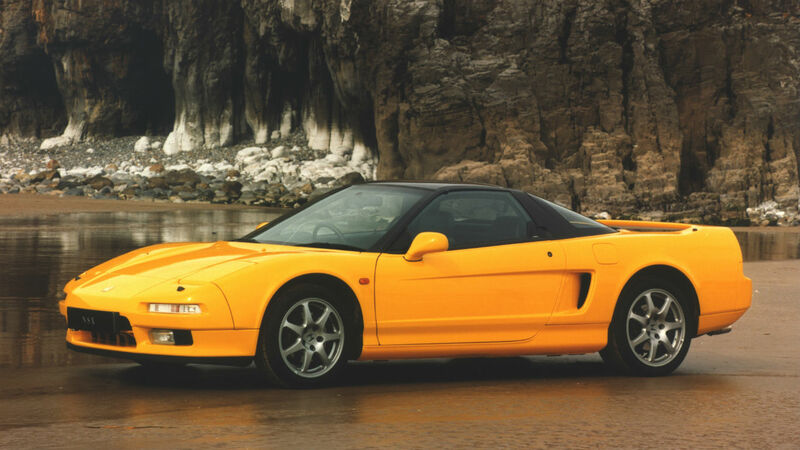 Perhaps the most obvious alternative today is the original Honda NSX. Launched in 1990, the NSX has an identical power output to the 328 and shares its mid-engined layout, wedgy profile and cockpit-style cabin. It’s a sharper drive than the Ferrari – and cheaper to buy, too. But it doesn’t offer the same investment potential. 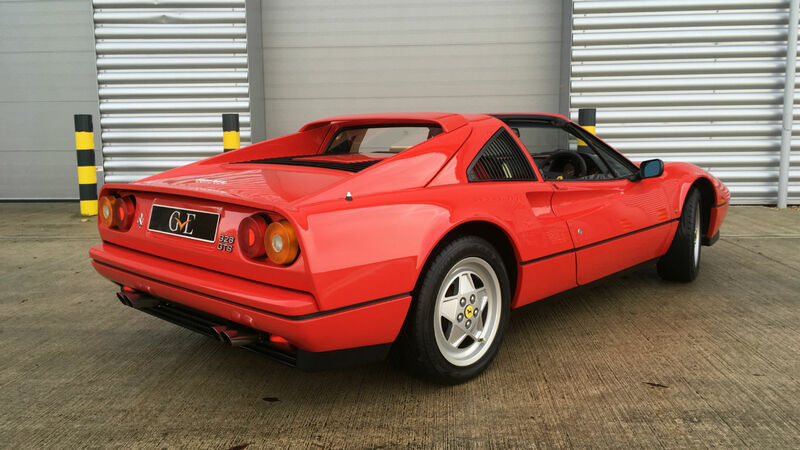 The 328 uses a 3.2-litre development of the 3.0 quattrovalvole (four valves per cylinder) V8 from the Ferrari 308. Maximum power is 274hp at 7,000rpm, while peak torque is 224lb ft at 5,500rpm. In a car weighing a modest 1,325kg, that’s good for 0-60mph in 5.5 seconds and a top speed of circa. 160mph. Ferrari’s open-gate manual gearbox looks timelessly cool, but boy it needs some muscle – especially when cold. I’m advised to short-shift from first to third until the oil is warmed-up. However, I immediately fail by forgetting first gear is on a dog-leg: down and left, where reverse might usually be. Forget your click-click flappy paddles, this car demands deliberate, decisive inputs. The same goes for the unassisted steering, which is heavy at low speeds, and the engine, which demands to be kept on the boil. The brakes are far better than most cars of this era, though, despite the pedals being ridiculously skewed towards the centre of the car. On damp, December tarmac, I won’t pretend I pushed the 328 anywhere near its limits. But I did escape the London suburbs and find some quiet lanes, stowing the targa top behind the seats (a two-minute job, incidentally) and relishing the rasp of the V8 as it bounced off the hedgerows. It took a while, but here the Ferrari and I had a meeting of minds. Its gorgeous Momo steering wheel danced in my hands as we dived through a series of bends, poised and precise. If offers no electronic safety nets, and thus no excuses. 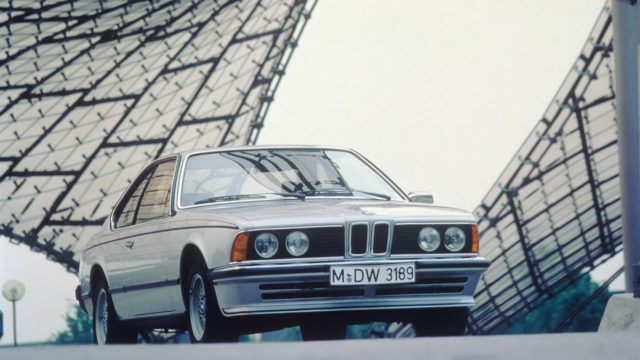 Driving a 328 is physical, cerebral and utterly analogue – and all the better for it. 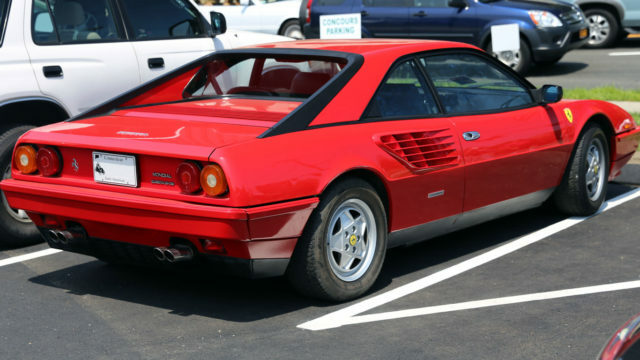 The 328 is considered one of the most reliable classic Ferraris. An evolution of the 308, launched in 1975, it’s a relatively simple car, free from electronic wizardry. Bosch K-Jetronic mechanical fuel injection was the order of the day here. 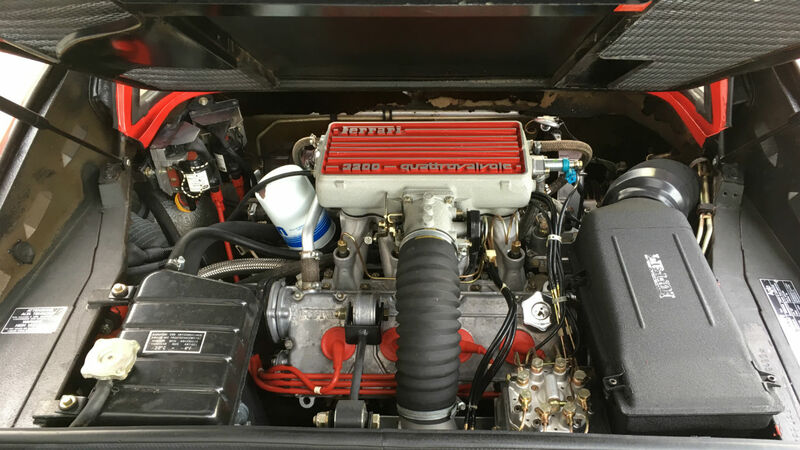 Unlike many Ferraris, a 328 can be serviced without removing the engine. This keeps servicing costs down: GVE estimates around £750 for a new cambelt, plus oil and filter change. Taking into account wear-and-tear parts, such as tyres and brake pads, budget around £2,500 a year in total. Fuel economy is quoted as 22.5mpg at a constant 56mph – and probably low teens if you give the car a workout. Still, look after your 328 and it should be an appreciating asset. With luck, that rise in value could outweigh the running costs altogether. In theory, yes. Amazingly, the 328 is shorter and narrower than a current Ford Focus, so it’s compact enough to feel nimble in the city. That’s not something you could say about the wide-boy Testarossa, or indeed the majority of 21st century supercars. 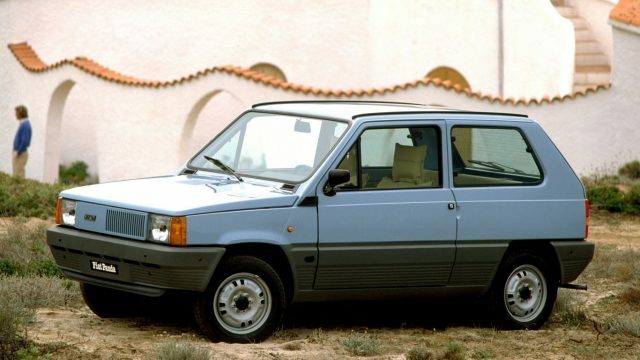 Ride quality is better than modern machines, too – thank absorbent 55-profile tyres – and the 328 has enough luxuries (air-con, electric windows, um… a cassette player) to be comfortable on longer journeys. It feels like a sports car built for the road, rather than the racetrack. 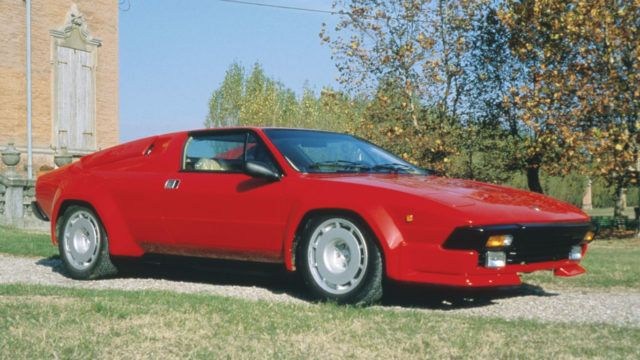 The 308 GTS was built in large numbers for a Ferrari. 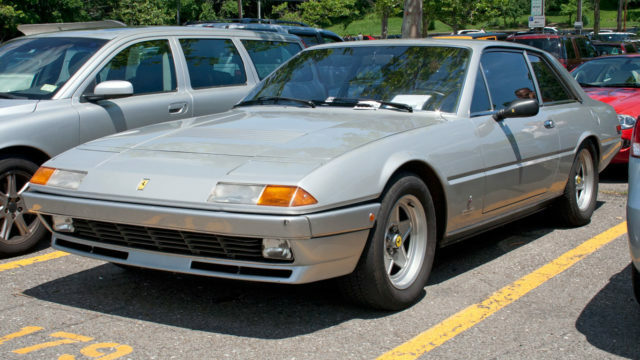 In total, 6,068 left Maranello, versus 1,344 for the hard-top GTB. Prices vary widely depending on mileage and condition. 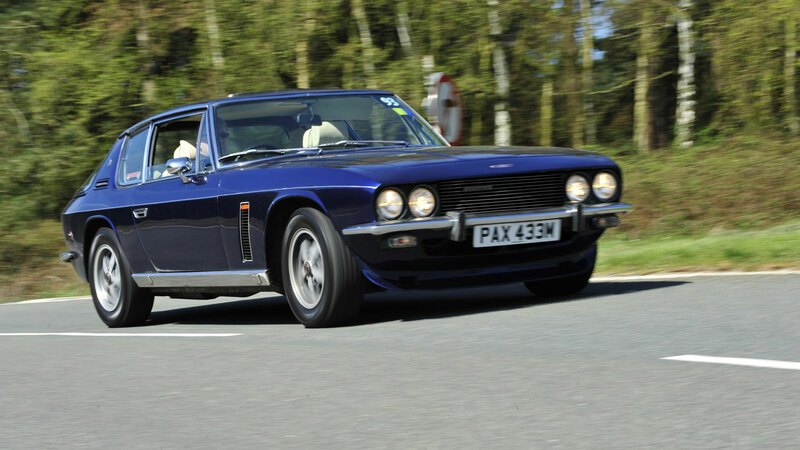 The cheapest UK-based GTS at the time of writing was a left-hand-drive car with 60,000 miles for £59,995. At the other end of the scale, a GTS with a scant 275 miles on the clock was advertised at £169,990. GVE’s car falls somewhere in the middle. It’s covered a modest 13,000 miles from new – the equivalent of less than 500 miles a year – and is offered at £129,900. As with all Ferraris, service history is of paramount importance. 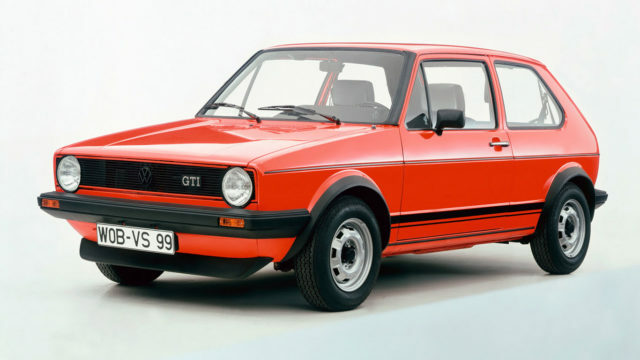 Originality is vital with older cars, too. 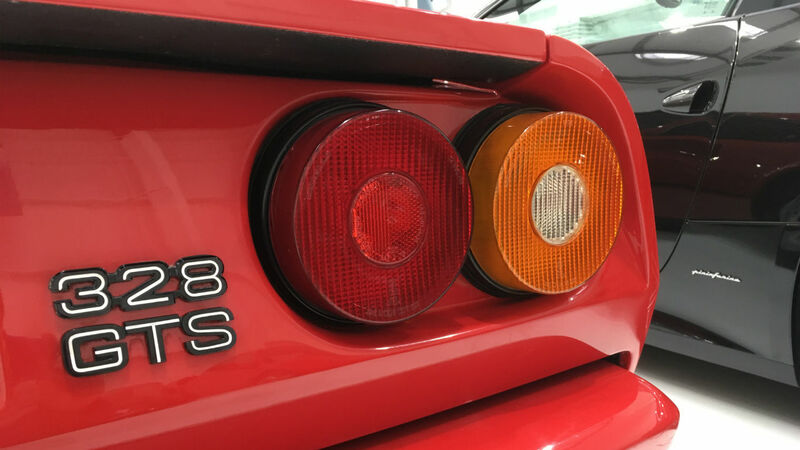 Don’t be scared off by service stamps from a specialist; they can be a better bet than Ferrari main dealers, who don’t necessarily know much about the classic models. All 328s had a galvanised body, so rust problems aren’t a big issue. However, check the bottoms of the doors and the back of the rear wheelarches for possible corrosion. Windows can become slow and shuddery through lack of use. This can be rectified by lubricating the moving parts inside the door. Always check that the air conditioning works efficiently. It wasn’t the most well-designed system in the world, and most cars have been converted to new gas by now. 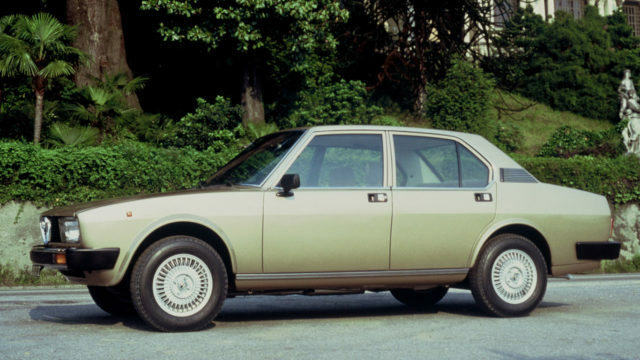 The Pininfarina-penned 328 is an object of beauty. I had one on my bedroom wall as a child and, unlike yours truly, it has only grown lovelier with age. It isn’t particularly quick by 2016 standards (a Ford Focus RS would leave it for dust), but that hardly matters. The Ferrari offers a driving experience that’s immersive, invigorating and intoxicating. It’s a car you’ll want to learn more about: to discover its abilities by developing your own. It isn’t perfect, but the quirks are all part of its character. 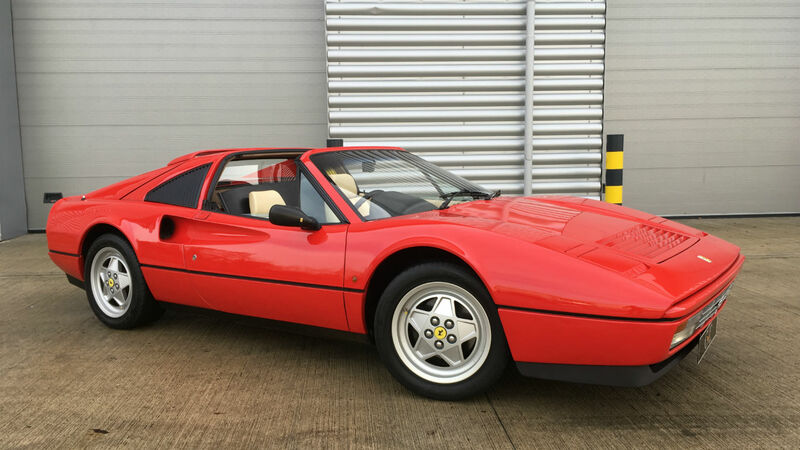 For the price of this particular 328 GTS, you could buy a new Porsche 911 Turbo, a car that is, objectively, better in every way. But that is missing the point. The Ferrari is a car to be enjoyed on sunny Sunday mornings and special occasions. And it’s a savvy investment, too. 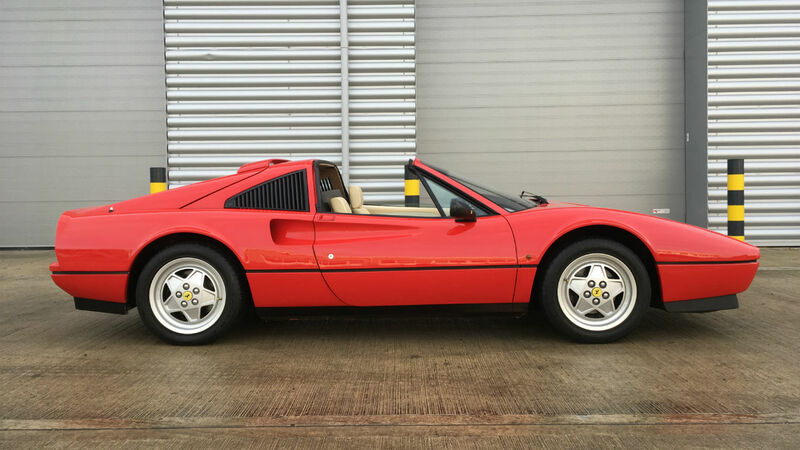 Ferrari built 542 UK right-hand-drive examples of the 328 GTS between 1986 and 1989. 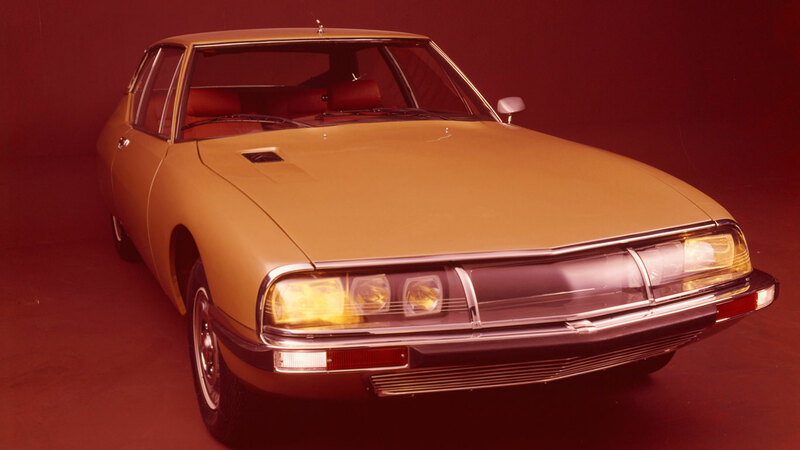 Of these, 292 had anti-lock (ABS) brakes. According to Guy Tedder, ABS, models are slightly less desirable due to revised suspension geometry that made the car feel less responsive. ABS cars – like the one seen here – are easily identified by their convex alloy wheels. Non-ABS cars have concave alloys. The classic car market is celebrating a buoyant end to the year, that’s according to data released by insurance firm Hagerty. Using data from the cars that generate the most enquiries, we present the 10 cars in reverse order. 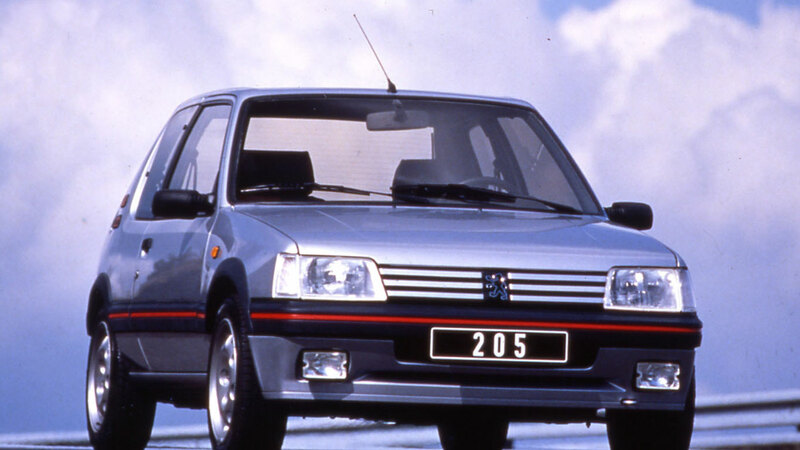 If you sold a Peugeot 205 GTI or Audi Quattro at the beginning of the year, you might want to look away now. 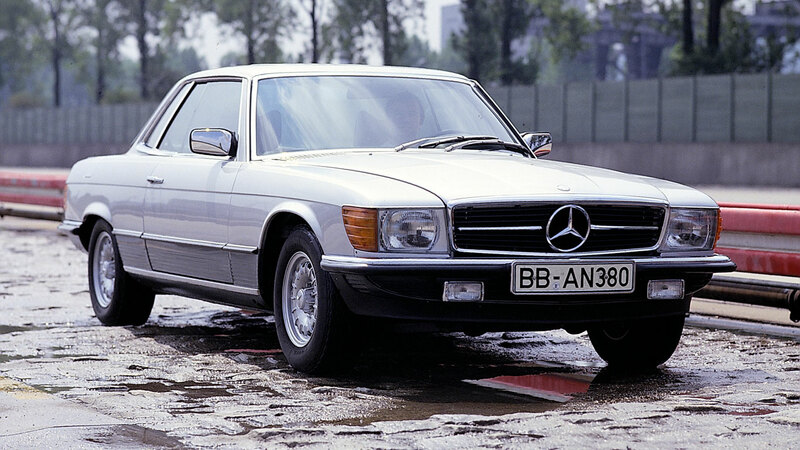 The 5.0-litre 450SLC was built to allow Mercedes-Benz to go racing in the 1978 World Rally Championship. 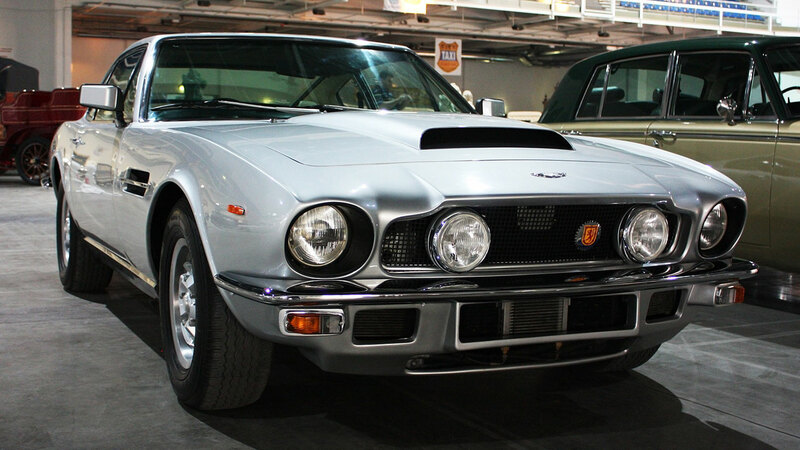 Of all the cars featured on the Hagerty list, we think this one offers the best value for money. 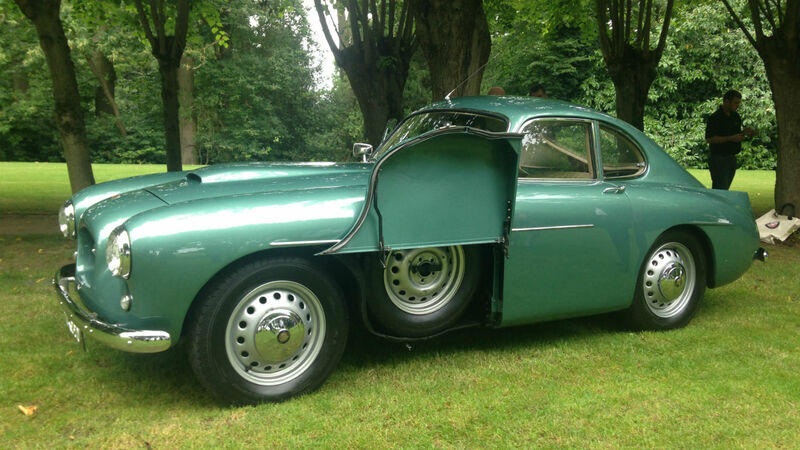 Just over £10,000 to secure what is undoubtedly far more interesting than anything offered by Mercedes-Benz today. 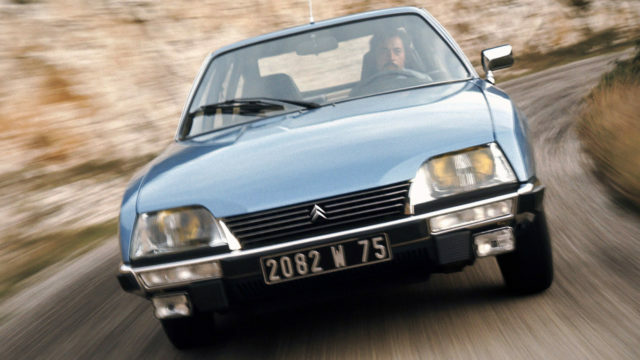 Speaking of things far more interesting… Values of the Citroen SM continue to head north, as the market wakes up to the fact that this was one of the coolest creations of the 1970s. 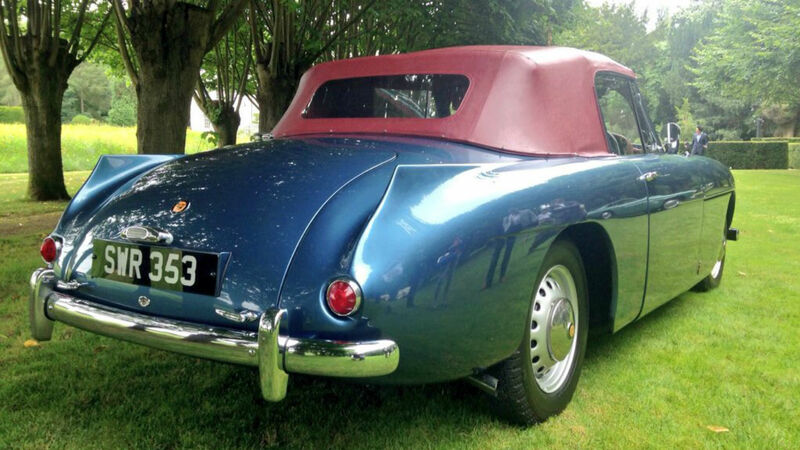 Part Citroen, part Maserati, the SM was a victim of circumstances beyond its control. As 911 values continue to spiral out of control, it’s logical that some magic dust would be sprinkled over other Porsche models. 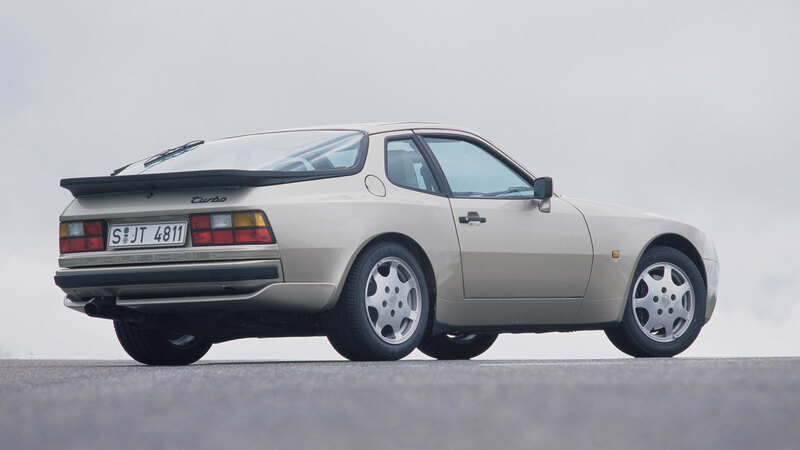 Not too long ago, you could secure a 944 for a nominal amount. 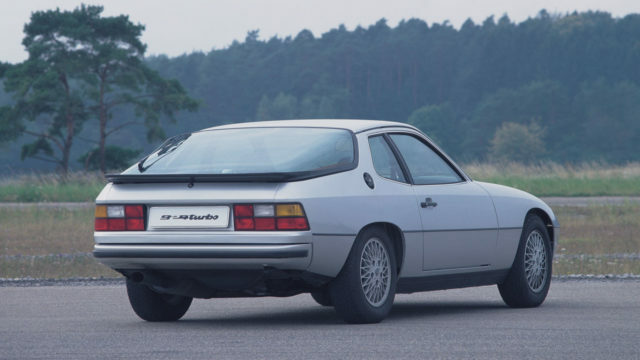 Today, the 944 Turbo has broken the £20,000 mark. Meanwhile, this Anglo-Italian grand tourer has enjoyed a remarkable 2016, with values shooting up from £37,425 to £51,250. That’s an increase of 36.9%. Wow. Just wow. A year ago we were reporting a 1.1% increase in values, but a further 70.8% increase has seen the 3.0 CSL break through the £80,000 mark and on its way to six figures. 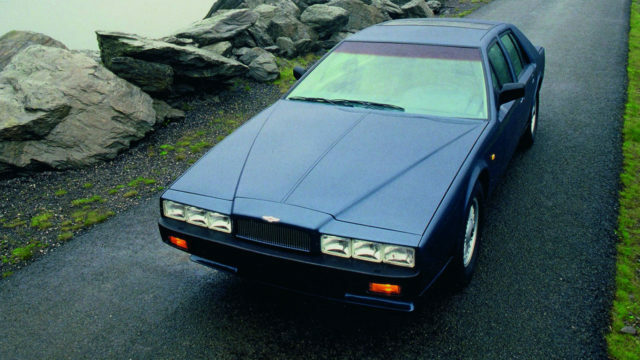 Not to be confused with the wedge-tastic Lagonda S2, the Aston Martin Lagonda S1 was a four-door version of the Aston Martin V8 (pictured). 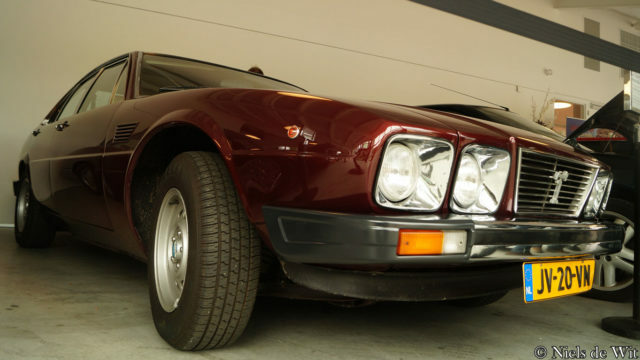 Only seven were ever built, so we’re surprised to discover that Hagerty receives so many enquiries about this limited-run car. Want bigger biceps without paying for gym membership? Ford has the car for you. Its new ST-Line models offer pumped-up looks without high fuel and insurance bills. More mouth and less trouser, if you will. 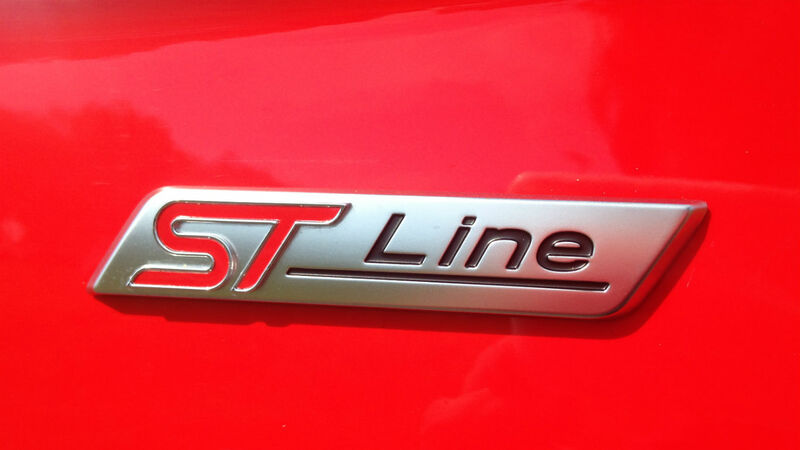 ST-Line is available on the Fiesta, Focus, Mondeo and Kuga and replaces the old Zetec S trim level. 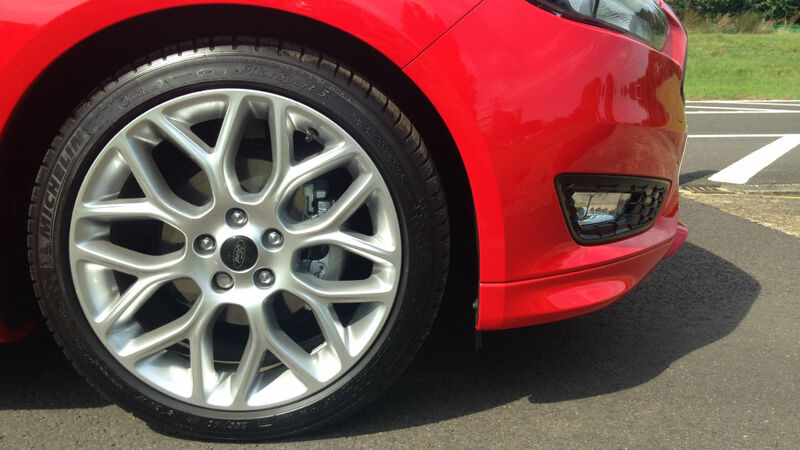 As well as racier styling inside and out, you get bespoke alloy wheels and 10mm lower suspension. 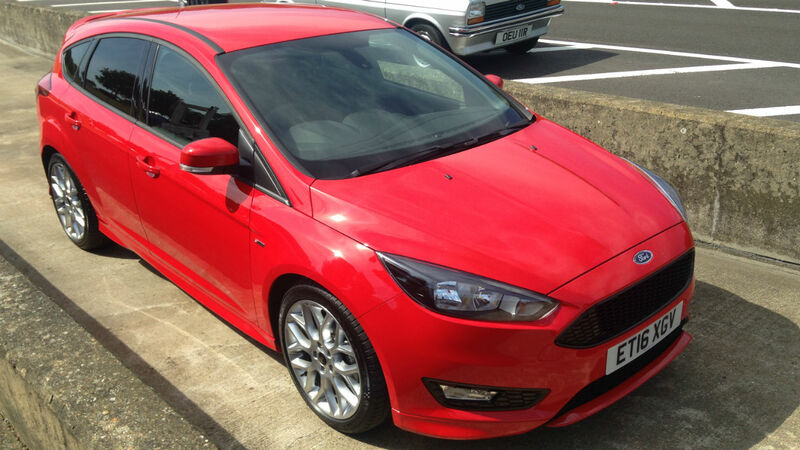 We tried the Focus 1.5 TDCi diesel in suitably sporty Race Red. 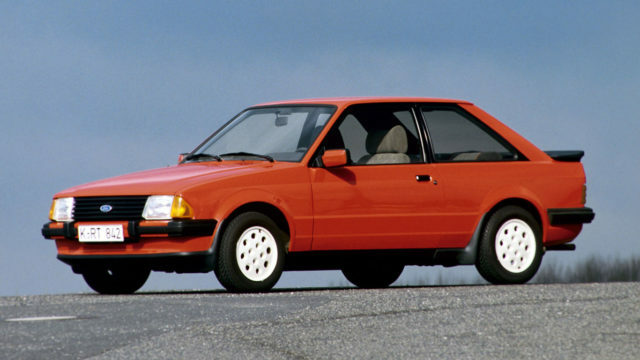 Has any of that fast Ford magic rubbed off on this otherwise humble hatch? The current Mk3 Ford Focus has been around since 2011, albeit with a facelift in 2014. As one of Britain’s best-sellers and a perennial fleet favourite, it’s not a car you should pay anything close to full price for. Discounts of 25% or more aren’t uncommon if you shop around – and that includes ST-Line versions. At the time of writing, ‘reverse auction’ website AutoeBid was offering the Focus 1.5 TDCi ST-Line hatchback – similar to the car in our photos – for £15,229. That’s more than 28% below the list price of £21,295. 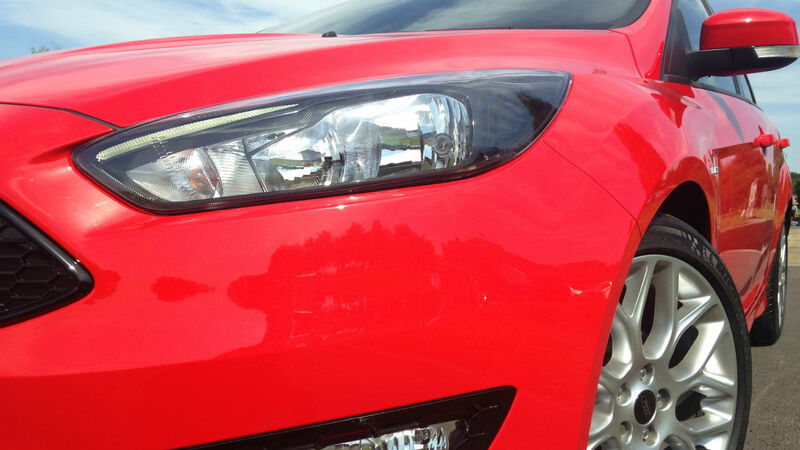 The Focus competes in the heartland of what car-industry types call the ‘C-segment’. 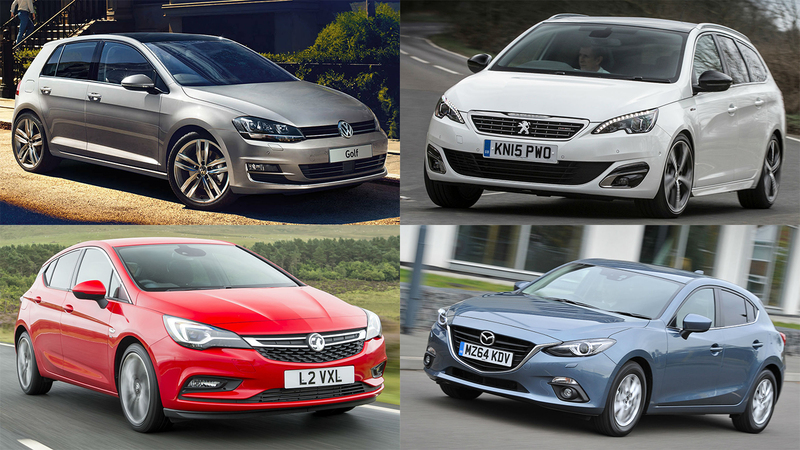 As such, its rivals include some very familiar names: the Volkswagen Golf, Peugeot 308, Vauxhall Astra and Mazda 3 to list but a few. Like the Focus, and the Peugeot pictured, many competitors also come as estate cars. Most also offer a ‘semi-sporting’ trim level to rival ST-Line. Peugeot has its GT Line models, for example. You can buy an ST-Line Focus with one of five different engines. The petrol line-up starts with the hugely popular 125hp 1.0-litre Ecoboost, then the 1.5 Ecoboost in 150hp or 182hp outputs. If you prefer diesel, there’s the 120hp 1.5 TDCi tested here, plus a 150hp 2.0 TDCi. The most powerful petrol and diesel engines are only available with a manual gearbox – all others can be specified with an auto. It might boast deeper bumpers and a sizeable rear spoiler, but a 120hp diesel engine doth not a hot hatch make. The 1.5 TDCi hits 62mph in 10.5 seconds and has a top speed of 120mph. 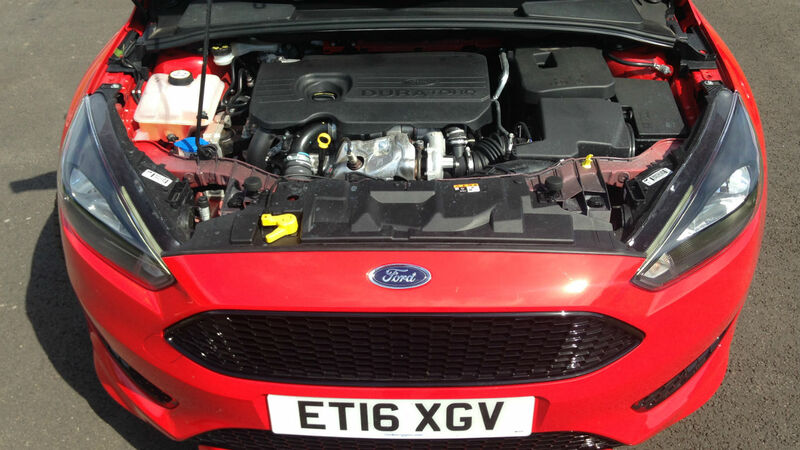 Compare that to 8.1 seconds and 135mph for the ‘proper’ ST diesel – or 6.5 seconds and 154mph for the ST petrol. Nonetheless, ‘our’ Focus doesn’t feel slow. With maximum torque from 1,750rpm, there’s enough mid-range muscle for brisk overtaking. Its smooth, but not particularly quiet. 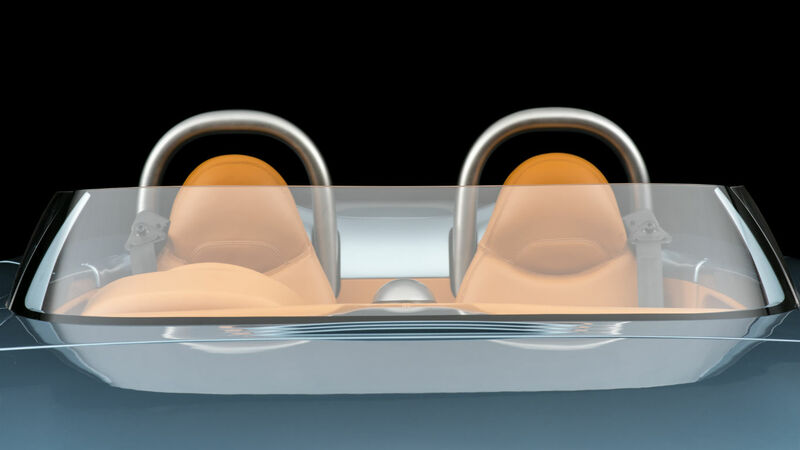 ST-Line cars sit 10mm closer to the ground on slightly stiffer suspension. Without driving one back-to-back with a regular Focus, we struggled to tell the difference. Suffice to say, the ST-Line still offers a good compromise between responsiveness and refinement. 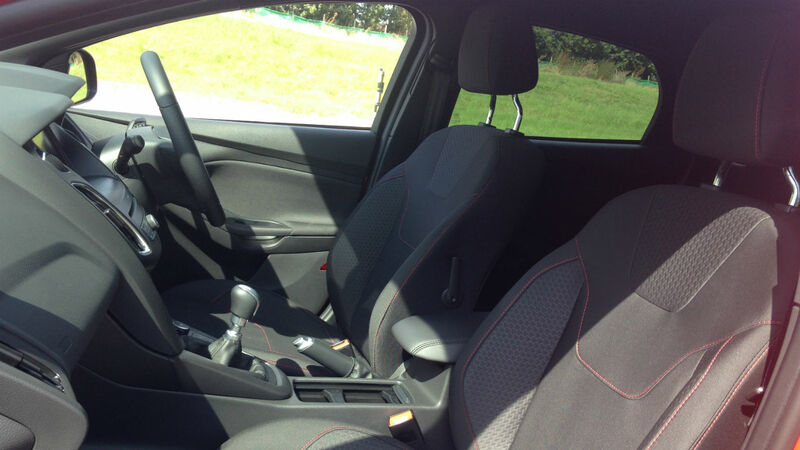 Inside, sports seats look the part, but won’t hug your hips like a pair of ST-spec Recaros. Look closely and you’ll also spot an ST gearknob, aluminium-faced pedals and a smattering of red go-faster stripes. Fancy. The Focus has always been a family car for people who actually like driving. And while the latest model isn’t a dynamic benchmark like the 1998 original, it’s still an engaging and entertaining steer. Proof you don’t need a hot hatch to have fun, in other words. Drop the kids off, find a quiet B-road and take time to appreciate the Ford’s taut chassis, direct steering and confidence-inspiring brakes. It feels poised and precise – without sacrificing long-distance comfort. Here’s the good bit. Behind all that Race Red, ST-branded attitude is an engine that emits a tax-free 99g/km of CO2, plus official fuel economy of 74.3mpg. Interestingly, the figures for the estate version are exactly the same, although you’ll pay an £1,100 premium for the bigger boot. It’s worth remembering that ST-Line trim costs £1,250 more than the default Focus Zetec, however. That’s the price of style. Those ST-Line additions give the Ford’s interior a useful lift, but there’s no escaping the slightly cheap plastics and fussy design. 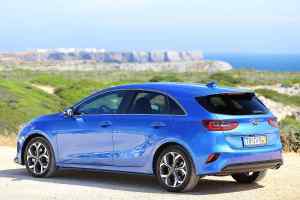 The general ambiance is no better than an equivalent Hyundai or Kia – and some way behind the rival Volkswagen Golf. You won’t have any problems getting comfortable, though. 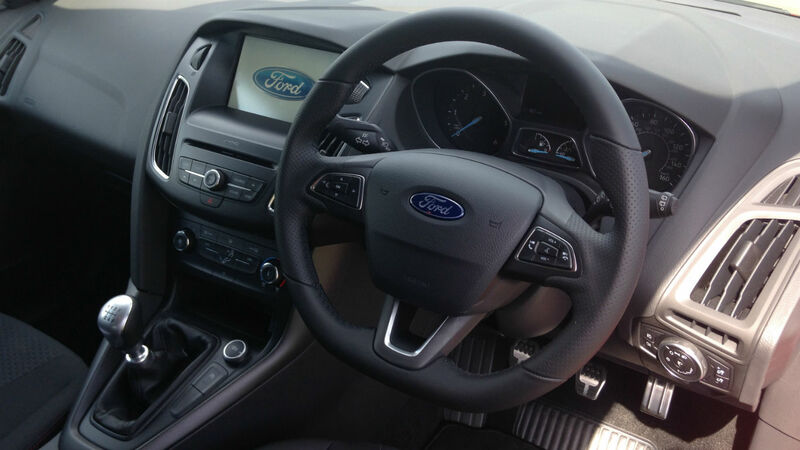 The driving position offers a wide range of adjustment and all controls are within easy reach. The chunky, three-spoke steering wheel gets a thumbs-up from us, too. Unlike previous models, the Mk3 Focus hatchback only comes with five doors, so access to the rear seats isn’t an issue. There’s ample room for children (with standard Isofix mountings for child car seats), but taller adults may lament the lack of legroom. The Focus hatch certainly isn’t as practical a crossover, such as the Nissan Qashqai. 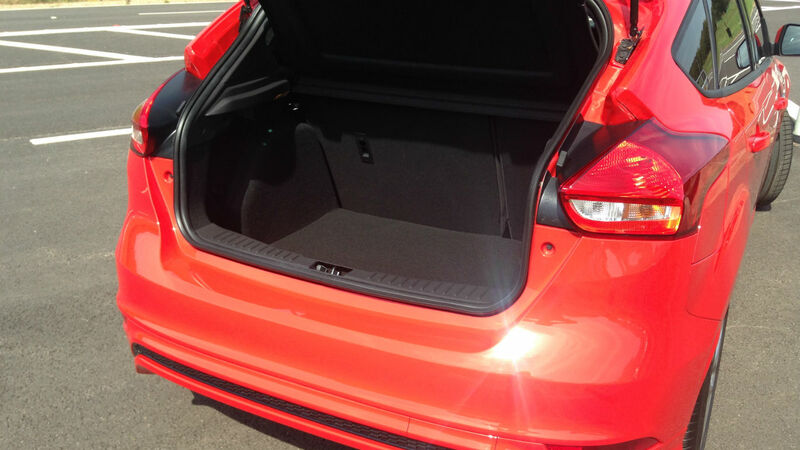 Boot space is 316 litres, or 1,215 litres with the rear seats folded. Compare that to 370/1,210 litres in the Astra and 380/1,270 litres in the Golf. 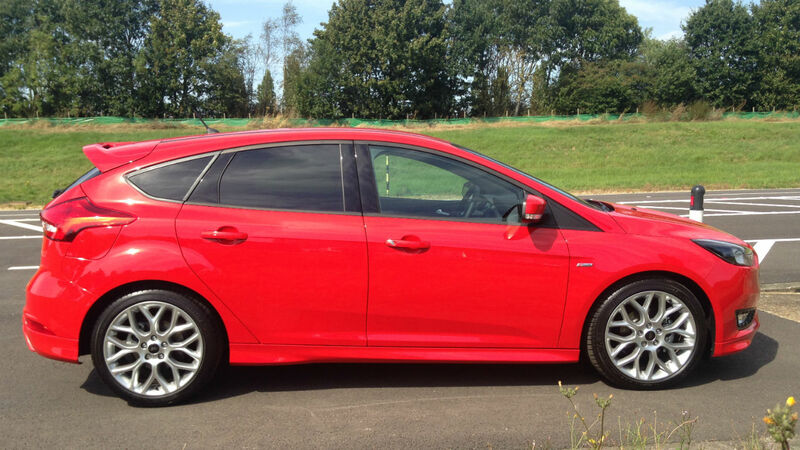 Opt for the Focus Estate, however, and capacity swells to 476/1,502 litres. Before its mid-life facelift, the Focus dashboard was a veritable button-fest, not unlike an old mobile phone. Now there’s a neat colour touchscreen, which is located high on the dashboard, easily within the driver’s line of sight. It’s straightforward to use, with bold, bright graphics and intuitive sub-menus. 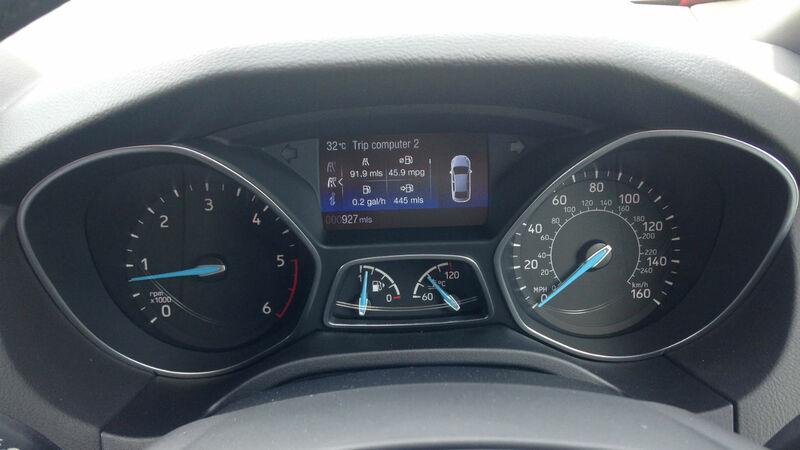 It’s certainly worth paying £300 for Ford’s Sync2 navigation system. We’d also fork out £225 for rear parking sensors, although the £250 rear-view camera seems like overkill. Bluetooth phone connectivity is standard across the Focus range. 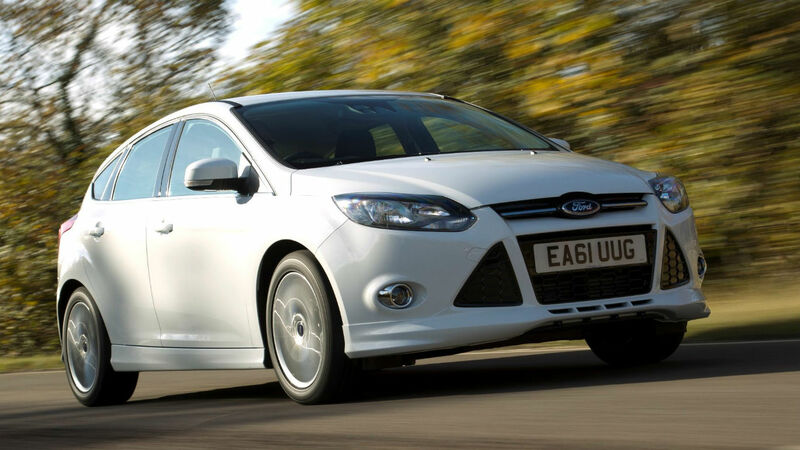 The Focus scored a full five stars in Euro NCAP crash tests. Standard safety equipment includes six airbags and electronic stability control. We think Active City Stop (an automatic emergency braking system) is well worth an extra £200. Alternatively, you could simply upgrade to the £550 Driver Assistance Pack, which includes Active City Stop, plus lane-assist, automatic headlights and wipers, traffic-sign recognition and a driver alertness monitor. What we’re really asking here is ‘Should I go for ST-Line?’. And, without wanting to sit on the proverbial fence, the answer really depends on your priorities. For the same money (starting from £20,595), you could have a Focus in Titanium-spec, which comes with front foglights, Active City Stop, rear parking sensors and automatic lights/wipers – all extra-cost options on the ST-Line. However, you’d do without the sporty bodykit and lower suspension. 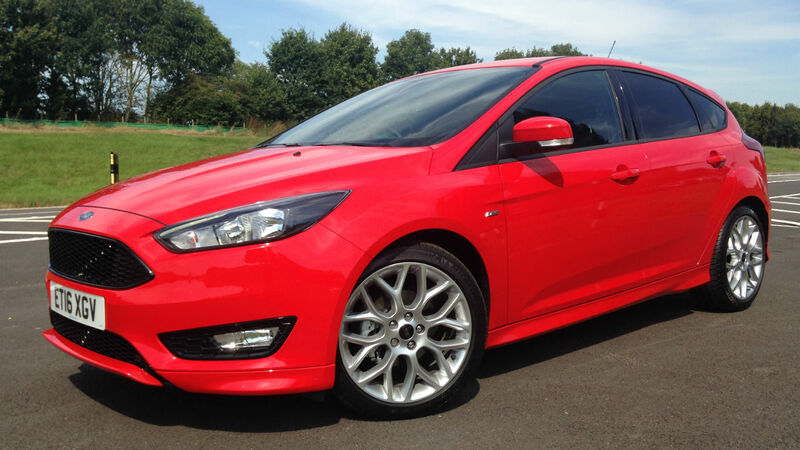 The obvious used equivalent to a new Focus ST-Line is the outgoing Focus Zetec S. This model has been around since late 2011, so there are cars in the classifieds to suit most budgets. The Zetec S came with a bodykit, 17-inch alloy wheels and suspension that was 28% stiffer than the standard car. Some also had part-leather seats. Us? We’d be tempted to put any money saved upfront towards the (hefty) fuel bills for a full-fat Focus ST.
Everybody loves a fast Ford. 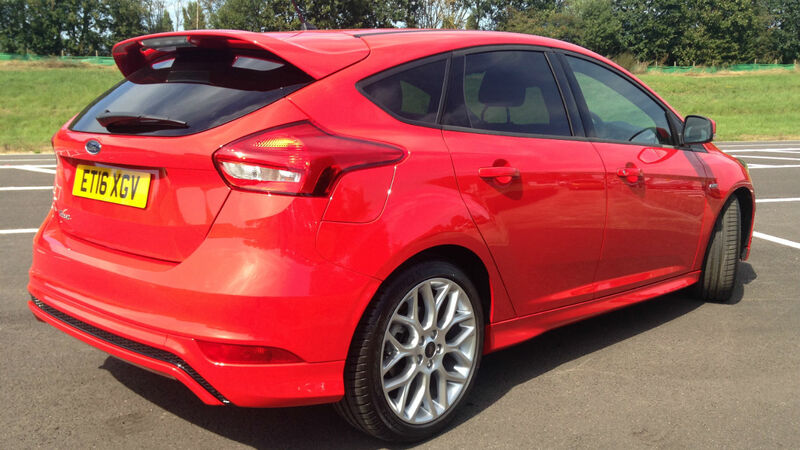 And while the Focus ST-Line isn’t technically, um, fast, it looks the part. For many, that will be reason enough to buy one. 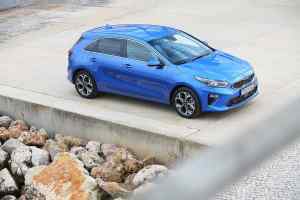 Importantly, ST-Line trim doesn’t detract from the Focus’s traditional strengths: agile handling, decent comfort and practicality, and an attractive price-tag (especially after discount). If you’re in the market for a C-segment car, it should definitely be on your shortlist. 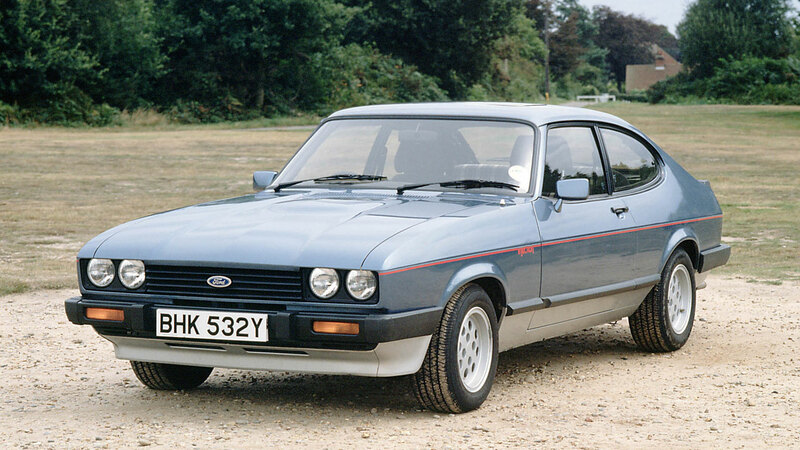 Ford first used its iconic RS badge in 1968, but the ST name didn’t appear until 1997. The Mondeo ST24 (pictured) had a 170hp 2.5-litre V6 and a bulbous bodykit. 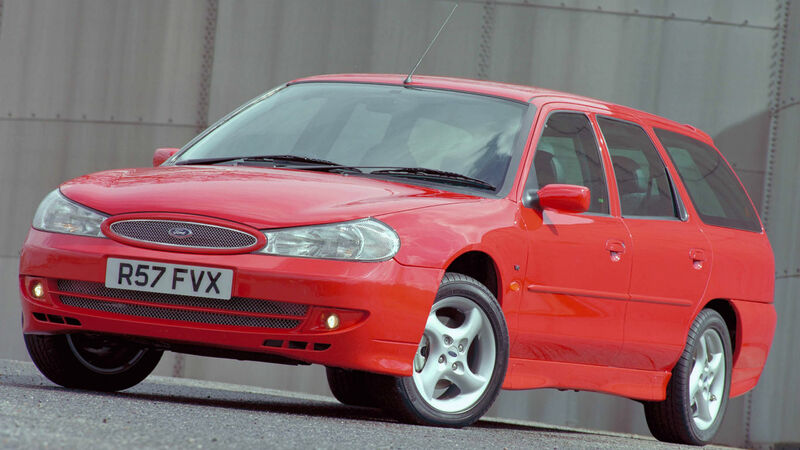 It lasted for just two years, before being replaced by the 200hp Mondeo ST200 in 1999. ST versions of the Fiesta and Focus followed soon after, with the high-point of the saga being the latest Fiesta ST: one of the greatest hot hatches ever made. 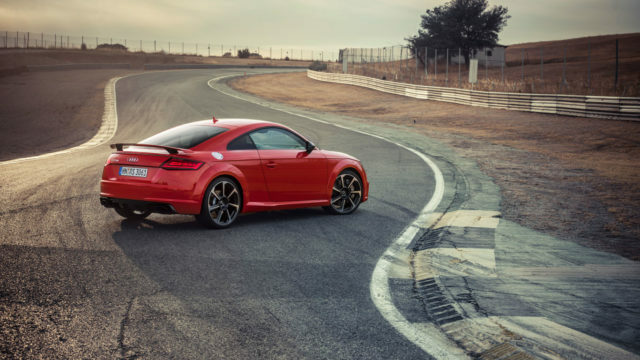 Let’s start with a stat: the new Audi TT RS hits 62mph from standstill in 3.7 seconds. That’s quicker than a Ferrari F40, Porsche 959 or Jaguar XJ220. Indeed, the RS can show a clean pair of Michelins to most supercars built before the millennium. It’s also just 0.2 seconds slower than Audi’s flagship R8. A bona fide baby R8? 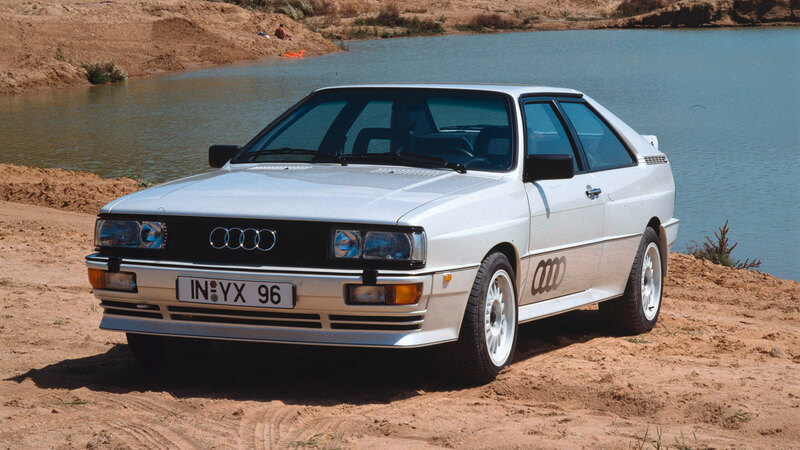 The formula for such savage speed is simple: more power, less weight and, of course, Quattro four-wheel drive. 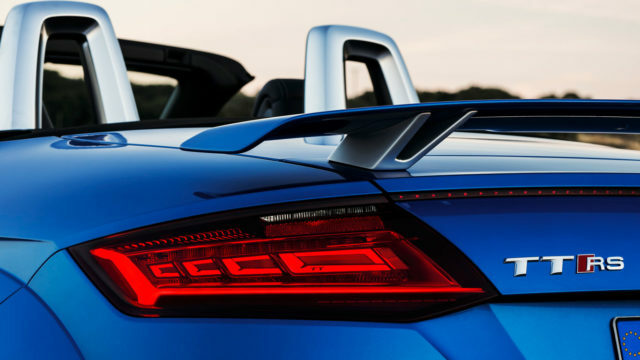 But faster doesn’t always equal more fun, especially when it comes to hot Audis. 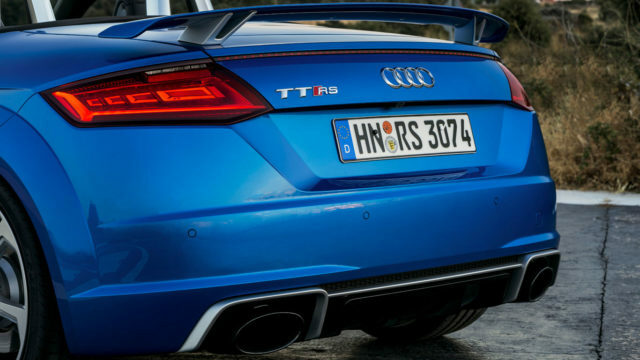 Is the TT RS a bona fide baby R8, or just a seriously hot hatch? We drove it on-track, then on challenging mountain roads, to find out. You can order a TT RS from late September, with first deliveries due in November. 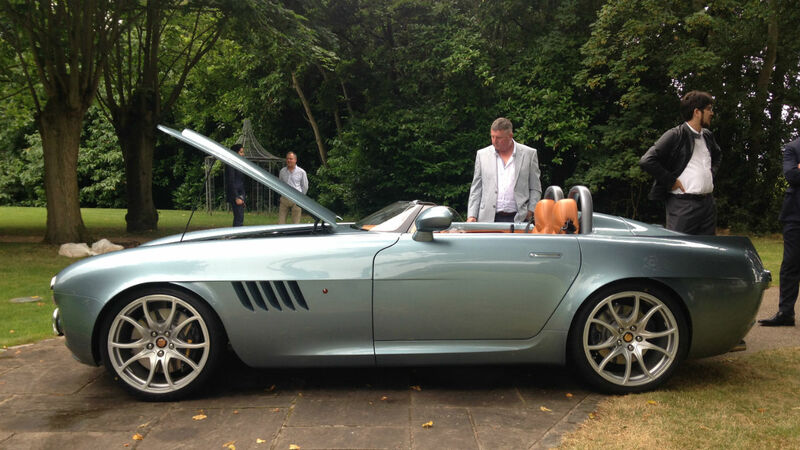 List price for the Coupe is £51,800, while the Roadster is £53,350. That’s pricier than an equivalent Porsche Cayman S or Boxster S, but still less than half as much as big-brother R8. However, this being an Audi, you’ll probably want to set aside at least £5k for extra-cost options. In terms of performance-per-pound, though, the TT looks solid value. 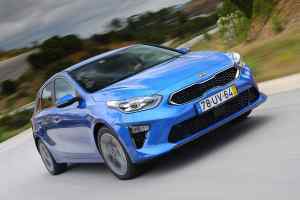 Its 2.5-litre, five-cylinder engine pumps out 400hp and 354lb ft of torque: more than even the hottest hatchbacks – the 350hp Ford Focus RS, 381hp Mercedes-AMG A45 and Audi’s own 367hp RS3 included. 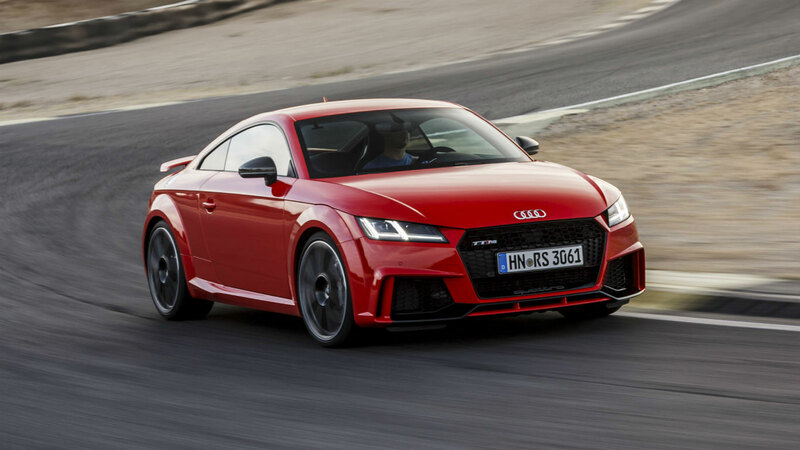 It also outguns the aforementioned Boxster/Cayman (350hp) and the outgoing TT RS (360hp). We start our test-drive at Jarama, a fabulous rollercoaster of a racetrack just outside Madrid. Used for Formula One until 1981, it offers a stomach-churning blend of blind apexes, off-camber corners and (gulp) short run-offs. 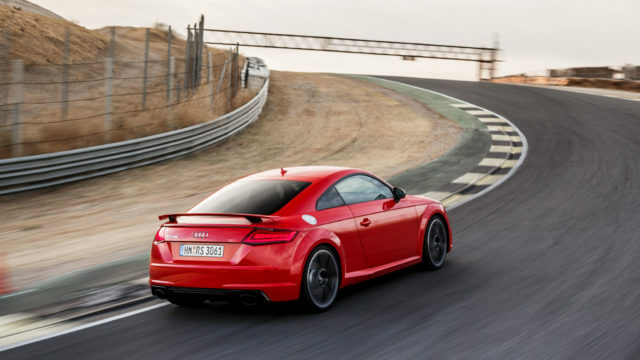 It’s the perfect place to put the TT RS through its paces. First, though, we line up to try the Launch Control – the easiest way to achieve that headline 3.7sec sprint to 62mph. 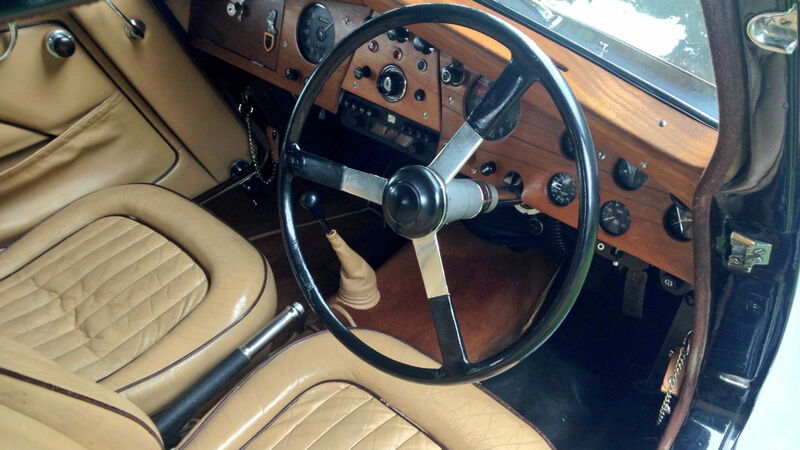 And it really couldn’t be easier: floor the right pedal, left foot off the brake and – wham! – the RS rockets down the main straight. It clouts you in the back and strains your neck muscles; the sheer ferocity of its acceleration is startling. God only knows what these full-bore starts do to the clutch. Still, there’s more to life than straight-line speed. 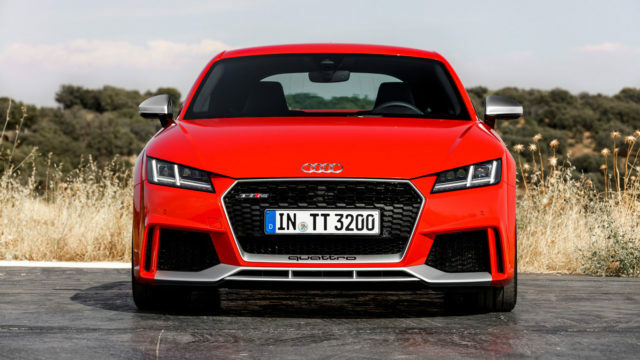 And if the TT RS is truly the pint-size R8 we’re hoping for, it needs to be just as fleet-footed in the corners. Good thing we’re on a racetrack, then. One immediate similarity with the R8 is the new steering wheel. Compact, flat-bottomed and Alcantara-wrapped, it adds an authentic motorsport feel – particularly with the new ‘satellite’ buttons for engine start/stop and switching drive modes. Shame you can’t have a manual gearbox as well; the RS comes with a seven-speed S tronic semi-automatic only. Heading into turn one – a hairpin right-hander – the Audi’s steering feels light and responsive. There’s barely any body-roll as the front tyres bite and Quattro four-wheel traction catapults us towards the next corner. Scything effortlessly through a tightening corkscrew, then a flat-out, uphill left-hander, the RS feels utterly planted. It simply grips and goes. As our confidence grows, we push harder, but the TT RS stubbornly refuses to be provoked. Even as grip turns to slip, it remains remarkably neutral. 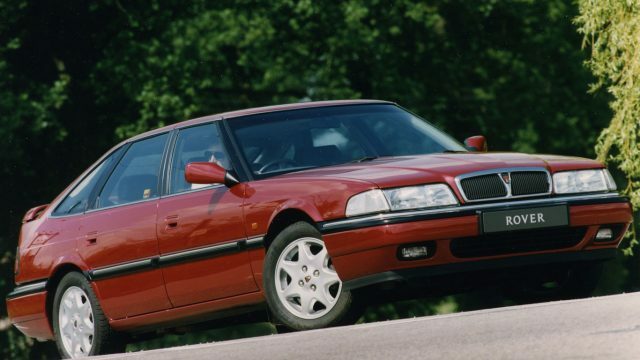 The juddering understeer of Audis past is just that: a thing of the past. We return to the pitlane with the smell of scorched rubber seeping through the air vents and smoke pouring off the (optional) ceramic front brake discs. 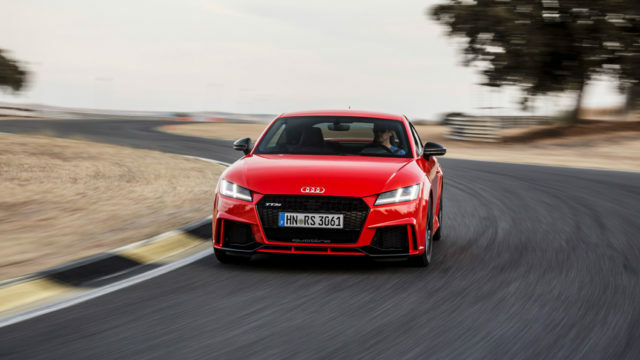 Clearly, the TT RS is an easy car to drive very fast. But it’s almost too capable on-track, lacking the poise and throttle-adjustability of a good rear-driver. Perhaps it will be more rewarding on the road. 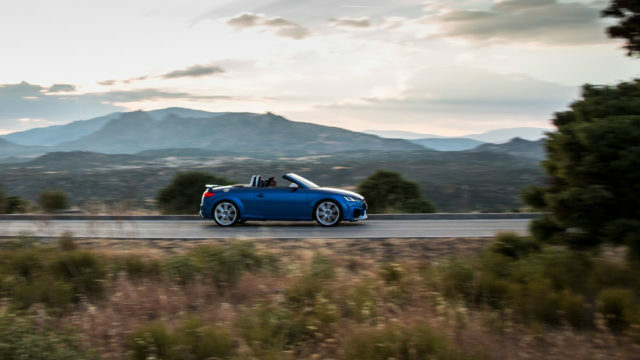 We swap into a Roadster for a drive into the Iberian countryside. The drop-top is 0.2sec slower to 62mph than the Coupe, but the chance to soak up some Spanish sun seems ample compensation. 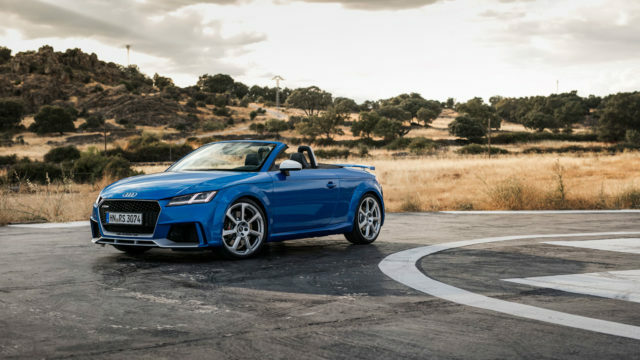 Besides, the TT RS looks even better with no roof. 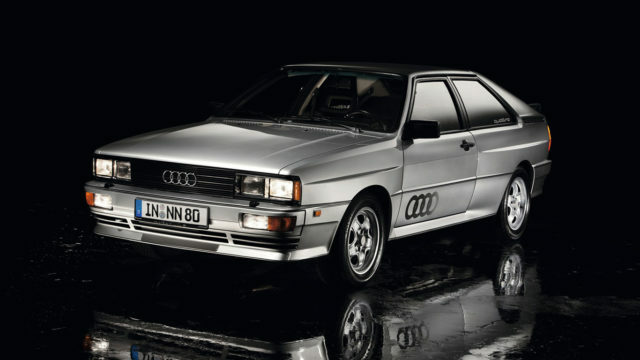 Hawkish headlights and a gaping grille with ‘Quattro’ lettering provide plenty of rear-view-mirror presence, while twin tailpipes and a fixed rear wing beef up the back end. 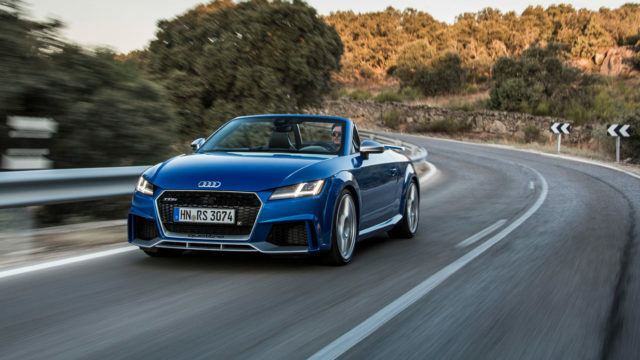 The TT’s exterior is simply an amuse bouche before the main course of its cabin, however. Stylish, ergonomically excellent and beautifully built, it’s one of the finest interiors of any car on sale. 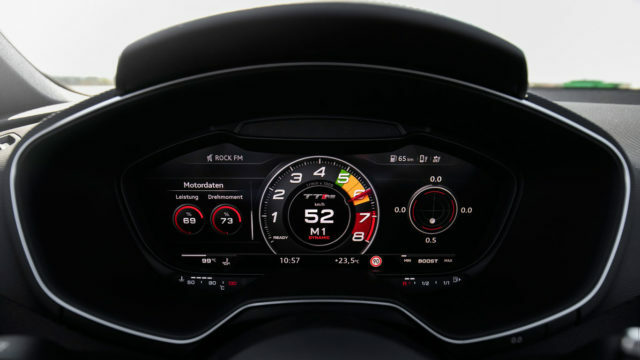 The centrepiece is Audi’s digital ‘Virtual Cockpit’, which takes the place of traditional dials behind the steering wheel. Standard-fit on the TT, the RS has an additional screen with a central rev counter and readouts for torque, tyre pressures, G-forces and other such geekery. You also get Audi’s excellent MMI Navigation system, subtle LED interior lighting and gorgeous quilted leather sports seats. Not that these offer much comfort if you’re seated in the rear. If you thought a Porsche 911 felt cramped, this is the next level of back-bending, neck-cricking claustrophobia. Our advice: consider the back seats a useful extension of the boot. Talking practicality, we should also mention fuel economy: a claimed 34.4 mpg for the Coupe, with CO2 emissions of 187g/km (Roadster: 34.0mpg and 189g/km). Hardly ground-breaking figures, but at least strong residual values – 43% of list price retained after three years/60,000 miles, according to CAP – keep overall running costs down. 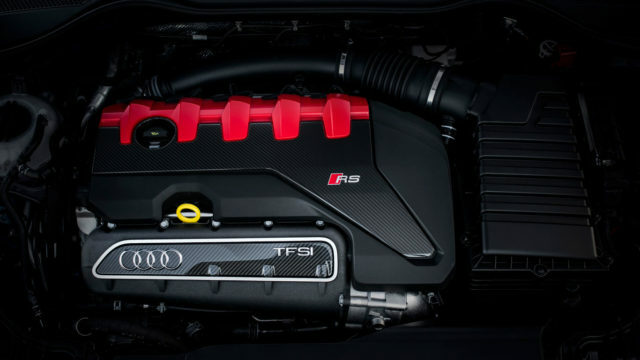 We press the red start button and the TT’s five-cylinder engine – an Audi RS trademark dating back to the original 1994 RS2 – erupts into life. Its pulsating growl, which swells into a hard-edged snarl as the revs rise, is amplified by the lack of a roof. With the exhaust in sport mode, it sounds downright filthy. Leaving Jarama, the TS RS jolts over speed humps and jitters across broken Tarmac. The optional 20-inch wheels on our test car doubtless don’t help (19s are standard), but there’s no escaping that firm, borderline-uncomfortable ride. The pay-off comes as we head into the hills, switching Drive Select to Dynamic and changing gear manually using the paddles behind the wheel. On sinuous switchbacks that snake through rock-strewn valleys, the uber-TT feels in its element. Magnetic Ride adaptive dampers (another option, naturally) hunker it down deliciously, before another huge slug of turbocharged torque blasts us between the bends. It’s deft and controlled, yet utterly explosive. Phew. 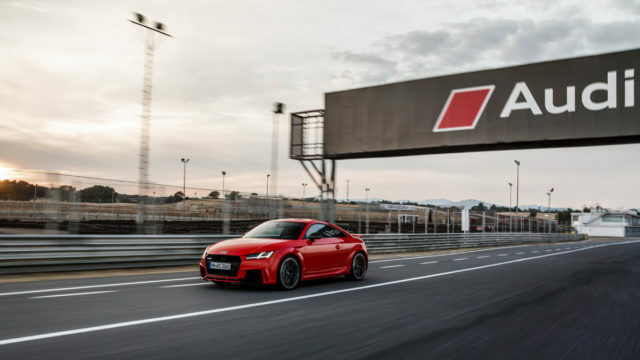 With exhausts ticking furiously in the heat, we park the TT RS back at Jarama and reluctantly return the keys. 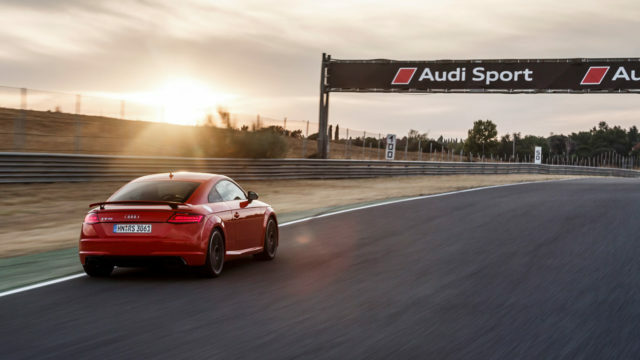 After a slightly underwhelming session on-track, the Audi has redeemed itself on the road. 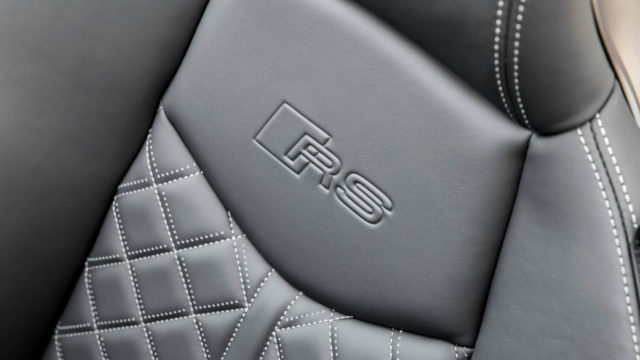 Where some RS-badged Audis – latest RS3 included – feel aloof, the TT RS comes alive. It’s a car you’ll genuinely enjoy driving, over and over again. However, there is a hulking Porsche-shaped elephant in the room, and its name is 718 Boxster/Cayman. We spent a week with a Cayman S shortly before the TT launch and there’s no question which German sports car we’d spend our (sadly, theoretical) £50k on. 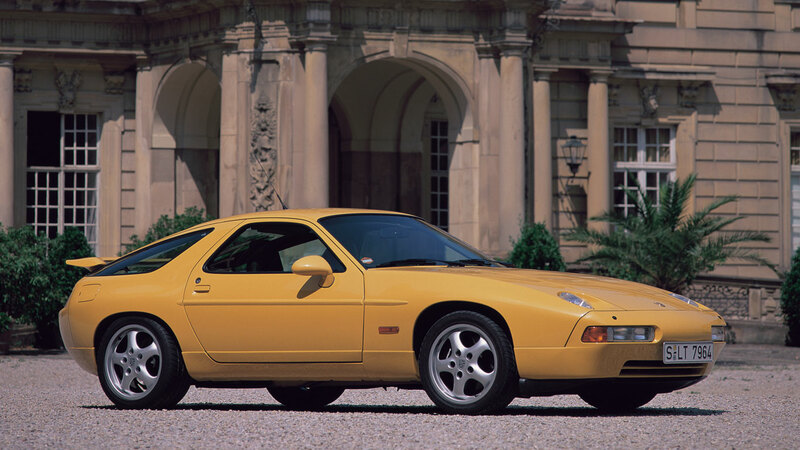 Despite reservations about its new, four-cylinder engine, the Porsche is a simpler, purer sports car – and all the better for that. Not convinced? We can agree to disagree. After all, the Audi is quicker, more powerful, better looking, nicer to sit in and will be more exclusive. It even has rear seats… sort of. But in those rare moments when the traffic clears, your focus sharpens and the road becomes a ribbon to be reeled-in, the Audi is merely memorable. The Porsche? It’s magic. 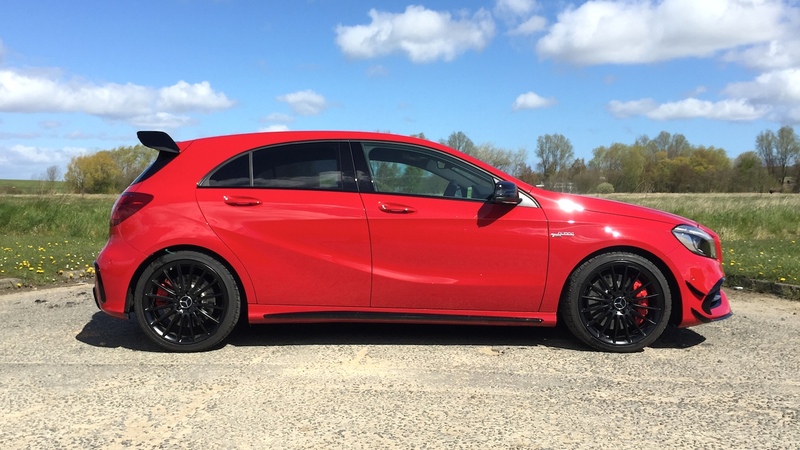 The hot hatch arms-race shows no sign of letting up, so – as part of a mid-life makeover – Mercedes-AMG has tinkered with the 4WD performance A-Class to make it truly weapons-grade. 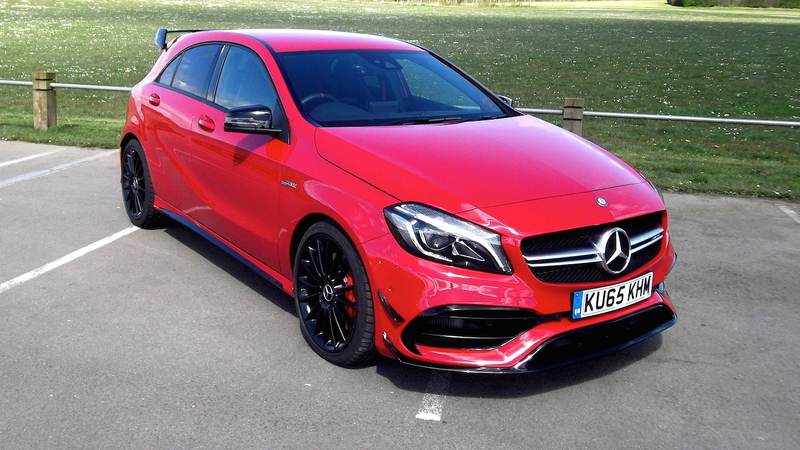 The original A45 could hardly be accused of lacking focus or performance, but this ‘entry-level’ AMG product now cements its place as the most powerful compact hatchback on sale, with 376hp. However, being top dog comes at a cost, literally, in the form of a big price tag. At £40,000, expectations are set high. With the Audi RS3 currently off the market while it undergoes a facelift, the closest rivals to the AMG A45 cost almost £10,000 less. The £31,000 Volkswagen Golf R is proving popular, through a combination of pace and pricing. It too packs a 4WD system, but can’t match the rabid pace of the A45. Ford’s Focus RS is impossible to ignore, but badge snobbery may put some people off – despite a bargain cost of £29,995. Honda’s front-wheel-drive Civic Type R also cuts under the £30,000 mark, but might not be the best investment for those who want to don’t want to attract attention. 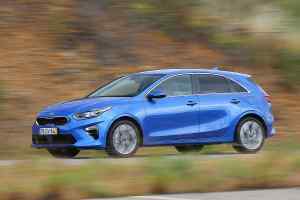 And the rear-wheel-drive BMW M140i has a six-cylinder engine and premium badge, if not quite the same pace as the Mercedes. It starts at nearly £32,000. Proving that this isn’t just a hotted-up A-Class, but a genuine AMG product, the A45 features a hand-built 2.0-litre four-cylinder turbocharged engine. The ‘one man, one engine’ philosophy means each unit comes with a signed plaque on the engine cover, letting you know who put it together. With 376hp and 350lb ft of torque, this is a serious motor. The 0-62mph sprint takes a scant 4.2 seconds, and top speed is limited to 155mph. 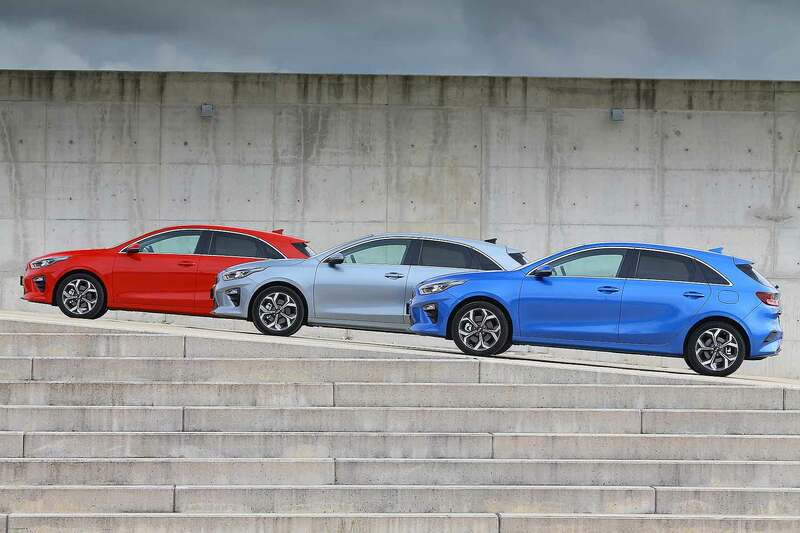 A 4Matic AWD system has the job of channelling all that power to the wheels through a seven-speed, dual-clutch ‘AMG Speedshift’ gearbox, with steering-wheel-mounted paddles. Fast. Very fast. In fact, almost incomprehensibly fast the first time you give it full throttle in Sport or Sport+ mode. There’s some minor turbo lag, but then the A45 unleashes everything in a way that’ll have you clinging to the AMG GT supercar steering wheel. It pulls all the way through the rev range, and feels every bit as rapid as the stats say it is. Such is the brutal ferocity of the way the A45 accelerates, you’ll be left in no doubt this isn’t just a normal hot hatch. 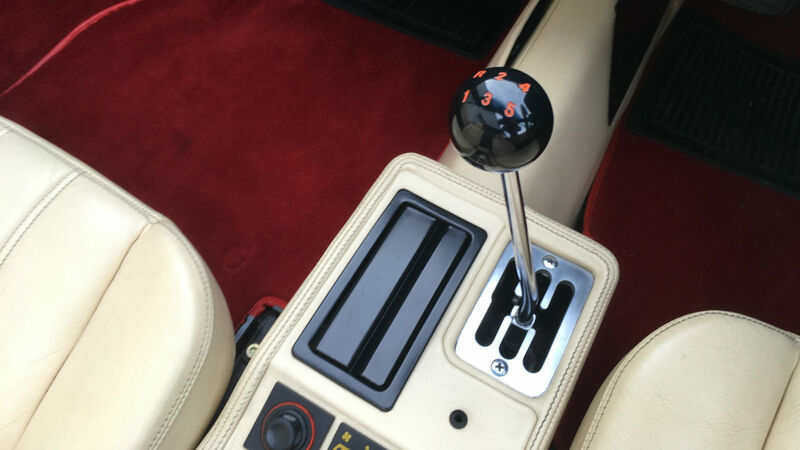 Gearshifts are rapid, whether the transmission is left in automatic or by using the manual paddles. Upshifts feature a pleasing crackle from the sports exhaust, while downshifts get a cheeky blip of the throttle, too. The noise made by the A45 is addictive, but can be muted by selecting Comfort mode. The ride is firm, but not uncomfortably harsh, and improves as the speed rises. There’s a feeling of infinite grip, matched with impressive traction from the AWD system. And while the steering lacks feel, it does at least weight-up accurately. Braking is as impressive, as you would imagine from a set-up that features big calipers and drilled discs. Despite having the performance of a 1990’s supercar, the A45 doesn’t have the matching thirst. Official combined fuel economy is rated as 40.9mpg, with CO2 emissions of 162g/km for cars wearing 18-inch wheels. In the real world, that translates to around 30mpg when cruising, but will drop further when you’re making use of all 376hp. There’s only so much a standard stop-start system can do. Band G road tax (VED) means £185 a year, although be careful if you specify 19-inch wheels, as this pushes the A45 into the £220 Band H due to increased CO2 emissions. 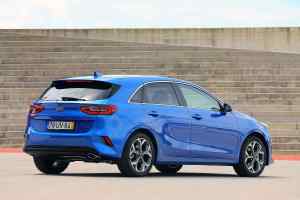 Being based on a regular C-segment family hatchback means the AMG A45 benefits from the same five doors and usable boot as the normal A-Class. 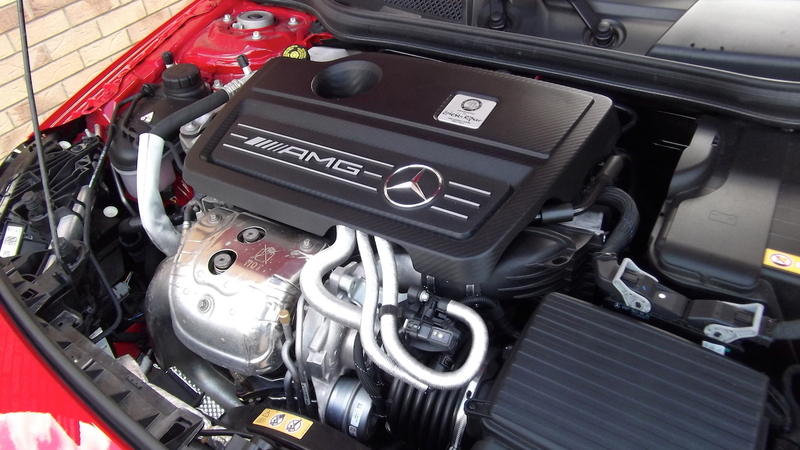 It’s perfectly capable of being used every day, especially with AMG mode in the Comfort setting. Beneath all the wings and spoilers, this is still a Mercedes, so safety hasn’t been forgotten in the quest for speed. The basic A-Class gained the full five stars in Euro NCAP tests, so it’s already starting from the best possible place. Add in a three-stage ESP system, collision prevention warning, brake assist and fatigue awareness, and the A45 racks up many points in the safety stakes. Also, as a Mercedes-AMG buyer, you’ll have the chance to attend the AMG Driving Academy, giving you one-to-one tuition in how best to handle your new car. There’s only one version, so it’s a question of how far into the options list you want to go. 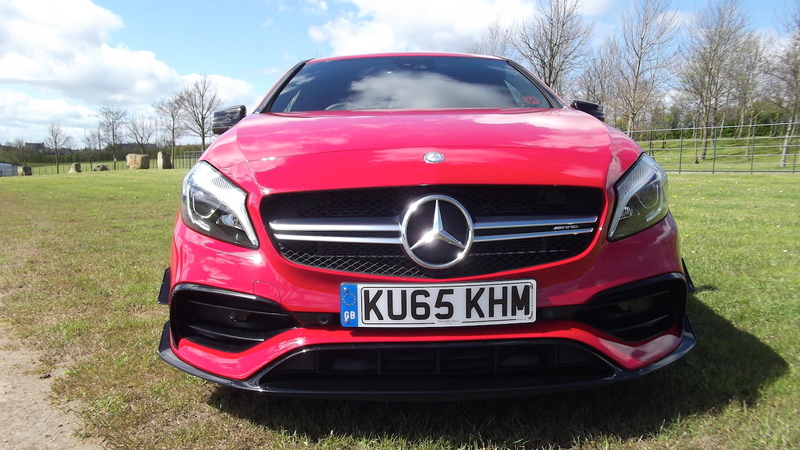 As standard there’s cruise control, dual-zone climate control, DAB radio, LED headlights and taillights, auto-dimming mirrors, even illuminated AMG-branded door sills. You’ll also find a standard 8-inch media display, with satellite navigation, which looks like an iPad but isn’t. You’ll undoubtedly learn this after several stabs at it, literally, until realising you need to use the rotary controller instead. Don’t forget the high-back bucket seats, which will make you feel like you’re in a BTCC racer, and do very much fit the price tag. 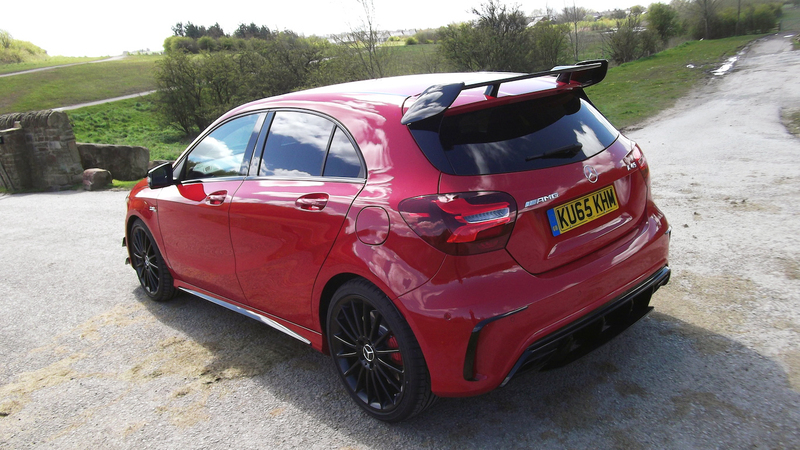 The sports exhaust adds £510, while that huge rear spoiler costs an eye-watering £1,530. 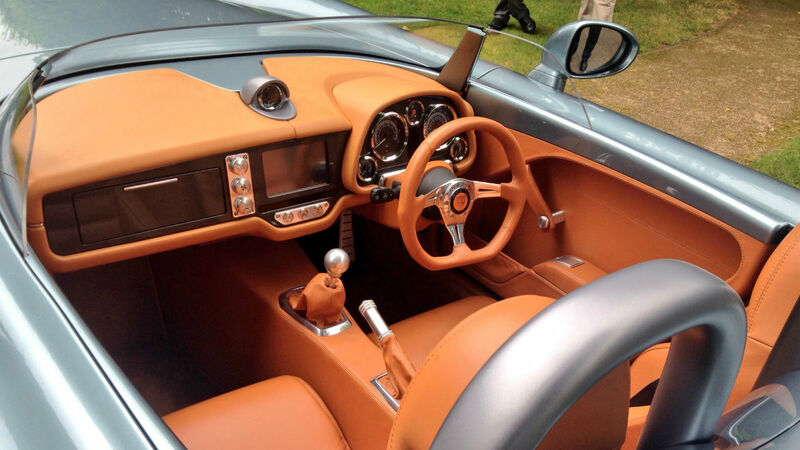 We would avoid the carbon fibre wing mirror covers, as they add on £1,230! There is a genuine risk of specifying a hatchback that costs the best part of £50,000 here. The Mercedes-AMG A45 is a staggering car to drive, with explosive performance and extraordinary levels of grip and traction. Driving cross-country, it could easily surprise and embarrass supercars costing several times more. Cost is perhaps the biggest barrier as, on a purely objective level, a Focus RS or Golf R can do 90% of what the A45 offers for £10,000 less. But for some there will be the overriding allure of owning a genuine AMG product, even if it doesn’t feature a high-capacity V8 engine. 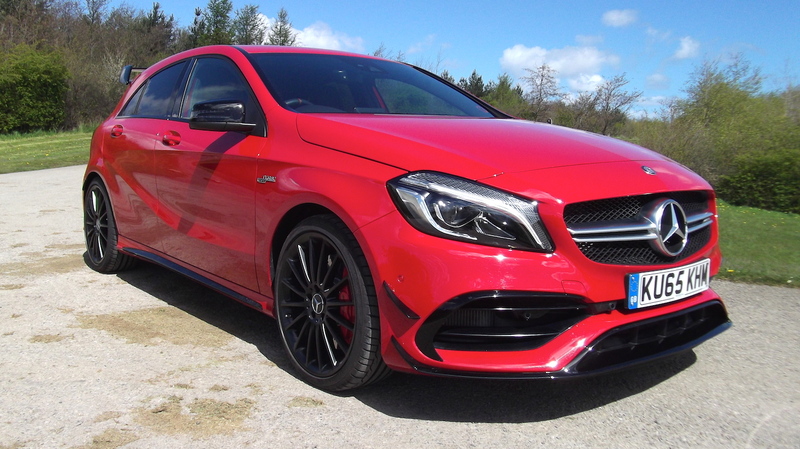 So, if you can afford it and want the ultimate performance hatchback, the AMG A45 is certainly one to consider. 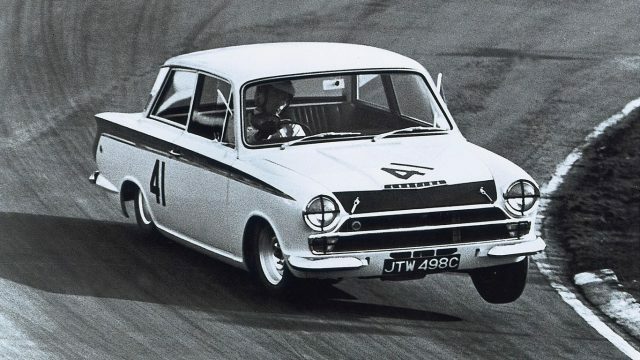 The A45 isn’t the first quick A-Class. Back in 1998, AMG decided the best way to make the original elk-worrying A-Class quicker was by adding a second engine. 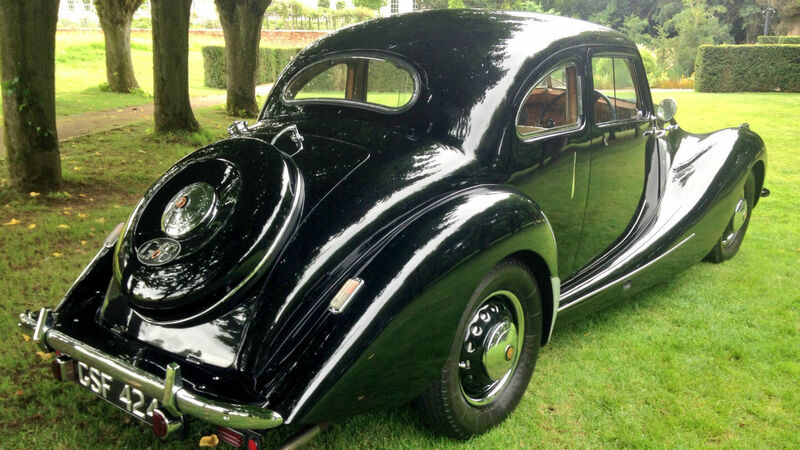 By slotting one 1.9-litre engine under the bonnet, and another one in the boot, the 250hp 4WD A38 was born. 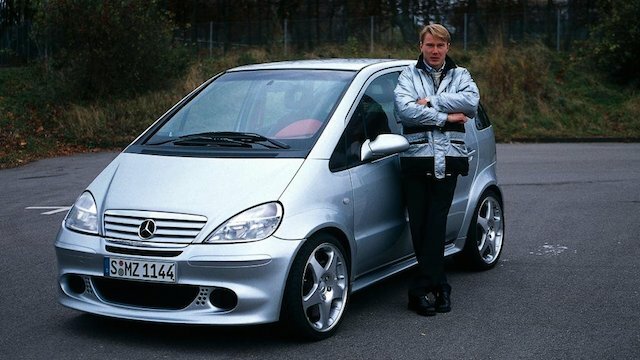 McLaren-Mercedes F1 driver Mika Häkkinen seemed suitably thrilled by the idea, it appears. Bristol is back! 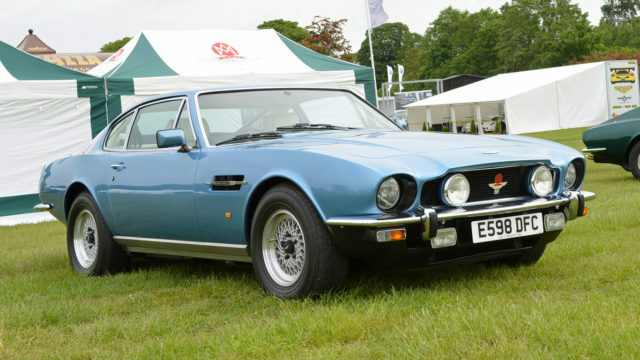 The Bullet is the first car from the British marque for 10 years. 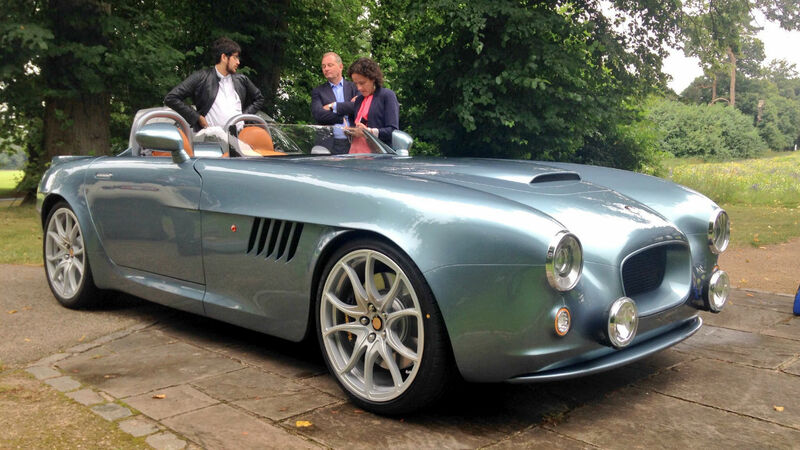 And this V8-engined roadster marks 70 years since the birth of Bristol Cars in 1947. Only 70 will be made, at a price of ‘less than £250,000’. 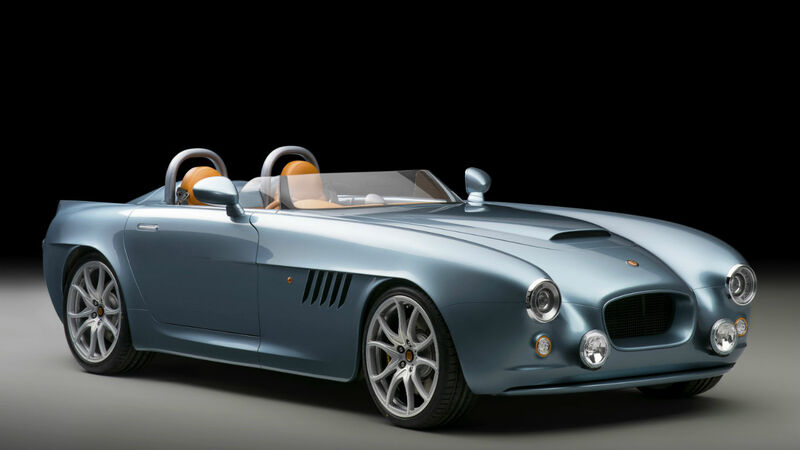 Designed in Britain, with help from an unnamed ‘Italian styling house’, the Bullet bears more than a passing resemblance to the iconic AC Cobra. 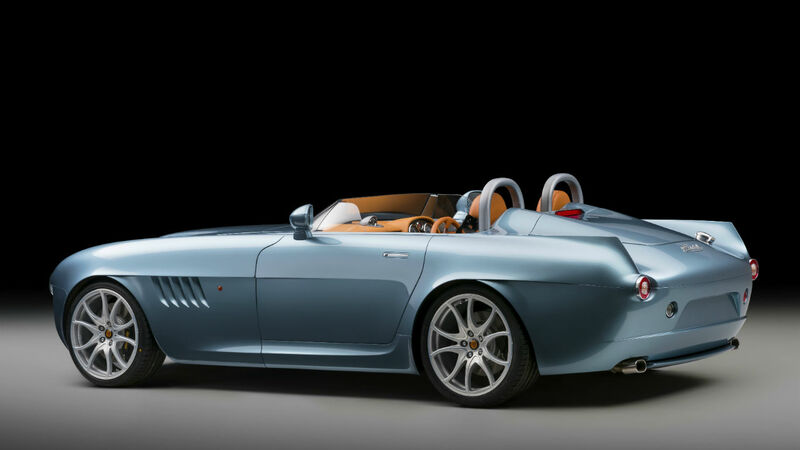 Bristol’s traditional tailfins make an appearance at the rear, along with speedster-style humps behind the seats. 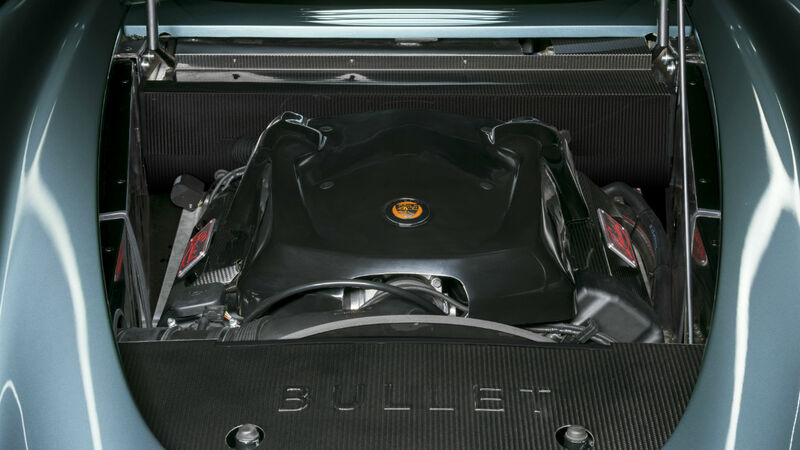 The Bullet’s heart is a 375 hp 4.8-litre BMW V8. In a car weighing just 1,250 kg, it provides 0-62mph in 3.8 seconds and a top speed of 155 mph. 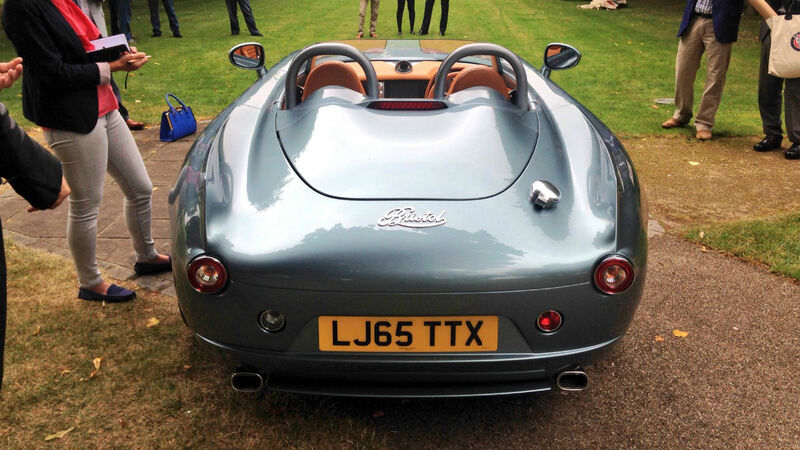 As our brief ride in the Bullet proved, it also sounds like a TVR that’s had elocution lessons. Fantastic. 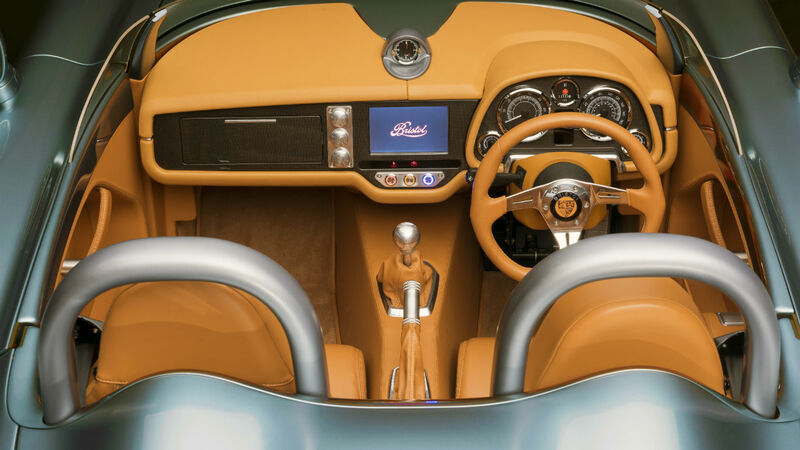 The interior of the Bullet mixes traditional materials with up-to-date technology. Bristol describes it as ‘perfectly suited to the modern age’. Apart from, er… the complete absence of a roof. We’ll come to that shortly. 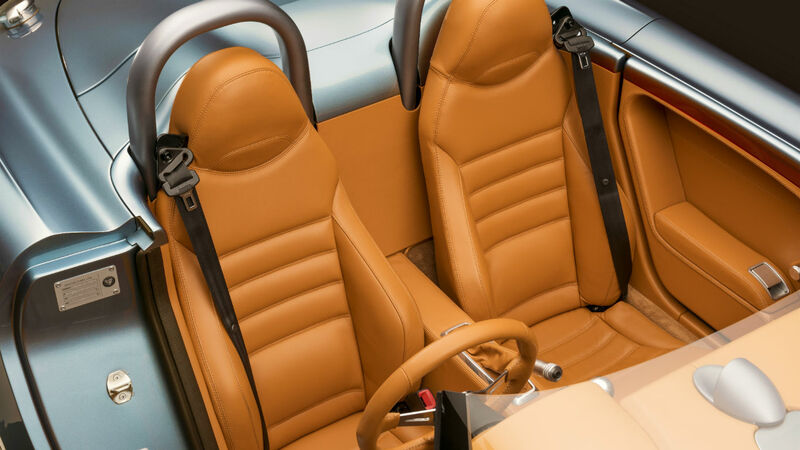 The seats are trimmed in soft British-sourced leather and are said to be ‘contoured for support and comfort over long distances’. The car’s suspension has also been tuned for road-biased comfort, rather than ultimate track-day agility. 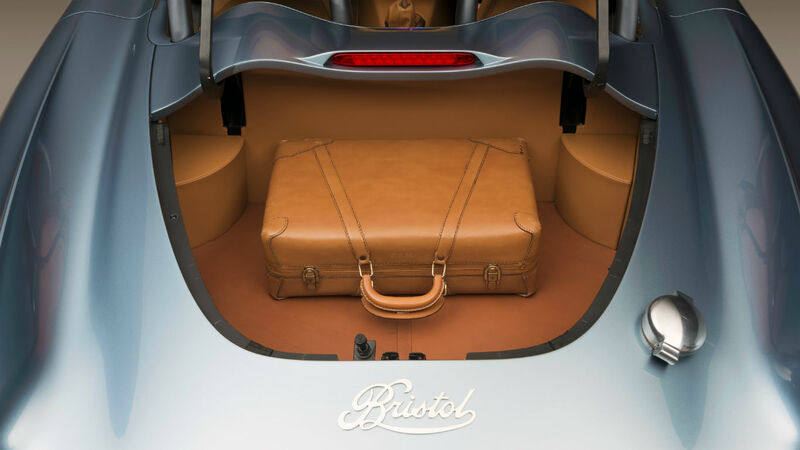 In keeping with its ‘grand touring’ premise, the Bullet has a leather-lined boot big enough for a couple of small suitcases. Note the beautifully-scripted Bristol badge. 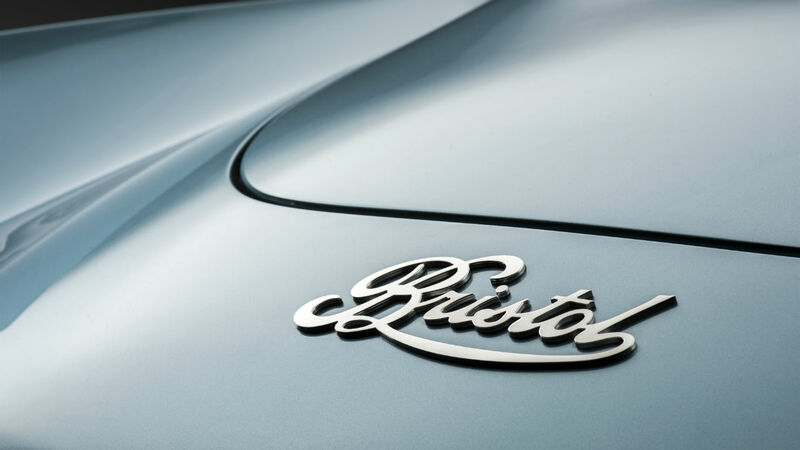 No premium car is complete without an LED light signature, and the Bristol doesn’t disappoint. 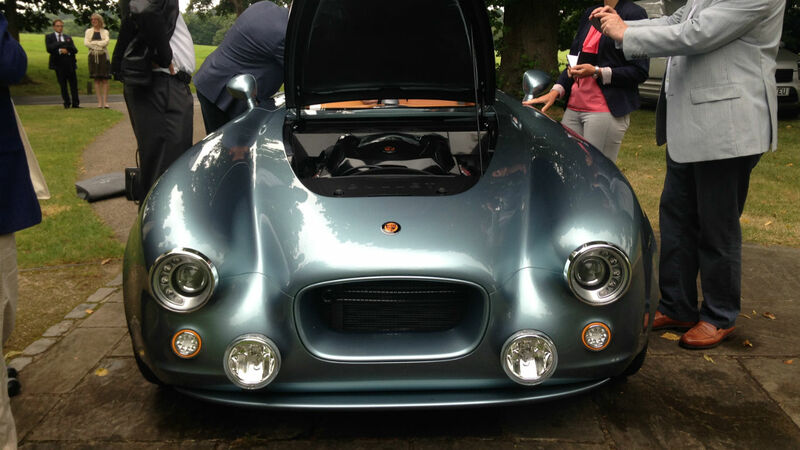 But why not a single spotlamp in the middle of the grille – in trad Bristol style? As noted previously, the Bullet is somewhat lacking in rain protection. There isn’t even a tonneau cover for when the car is parked. This half-height windscreen is optional, too. Owners can have no ’screen at all if they prefer. 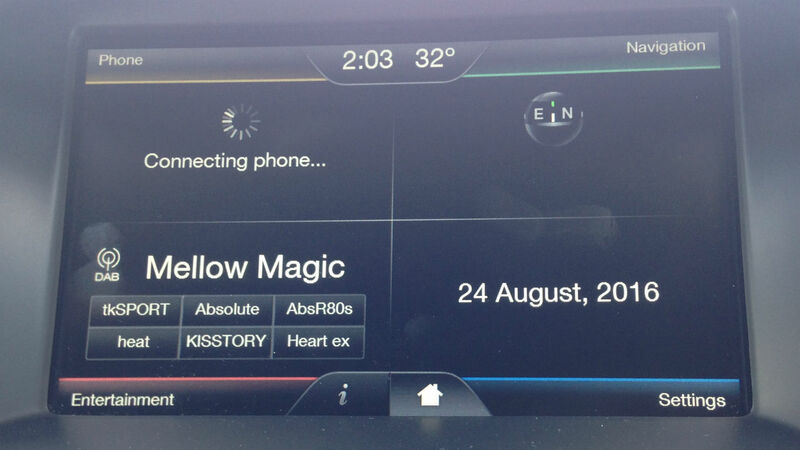 An eight-inch touchscreen controls ‘infotainment’ functions, with smartphone connectivity via Bluetooth or wi-fi. It can mirror your phone screen for instant familiarity, and even has a button to contact the Bristol showroom in Kensington, London. 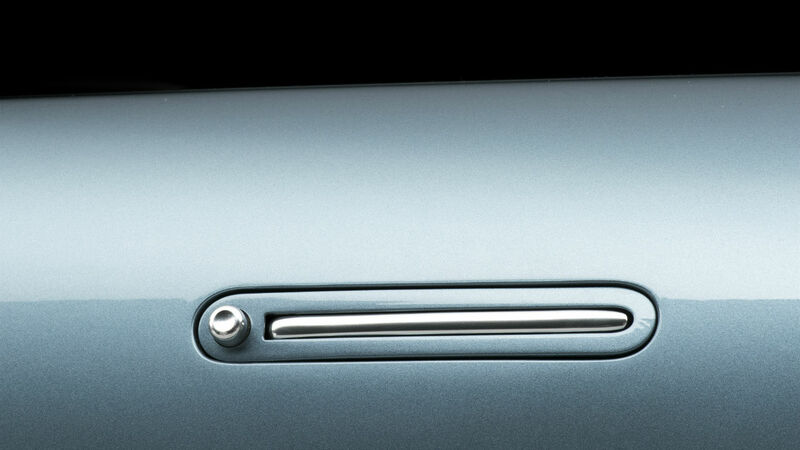 Some of the detailing on the Bullet is exquisite, such as these flush-fitting door handles that pop out from the bodywork when the button is pressed. 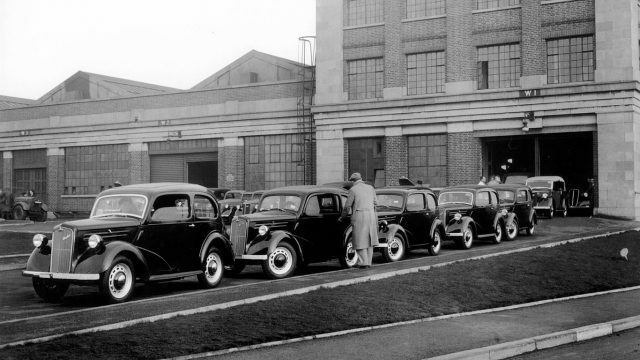 Bristol started life building buses in 1908, then moved on to aircraft engines and finally – in 1947 – cars. 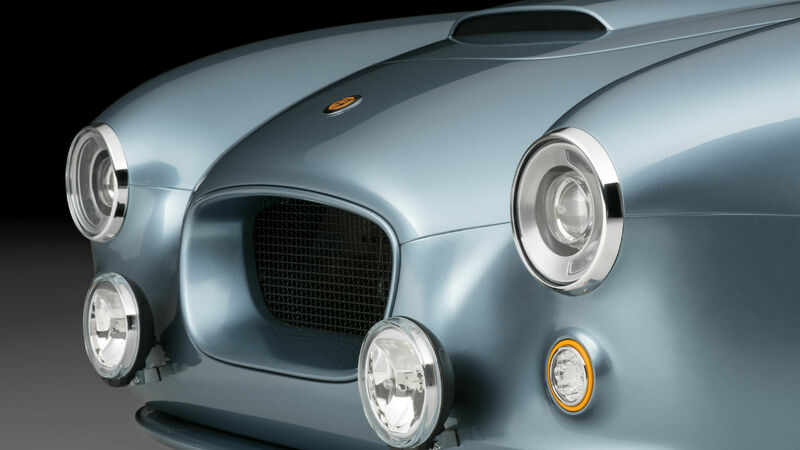 The first Bullets should reach customers in January 2017, marking 70 years since the original Bristol 400 left the factory. However, you can place your order now. 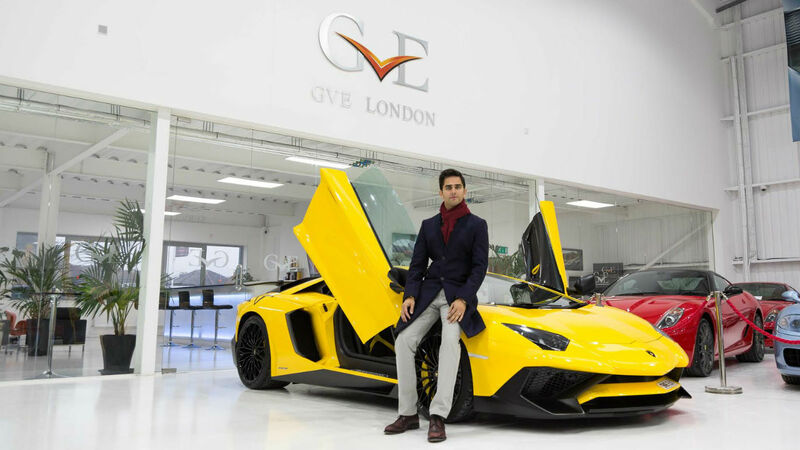 We were quoted a price of ‘less than £250,000’, although the final figure depends on personalisation options – such as custom paintwork or interior trim. If you can afford it, the factory in Chichester will tailor the Bullet to your individual taste. 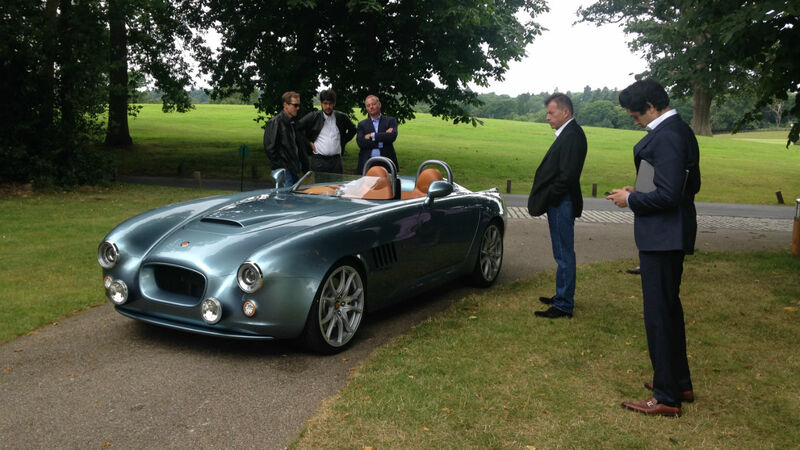 We attended the UK unveiling of the Bristol Bullet at Coworth Park, near Ascot. 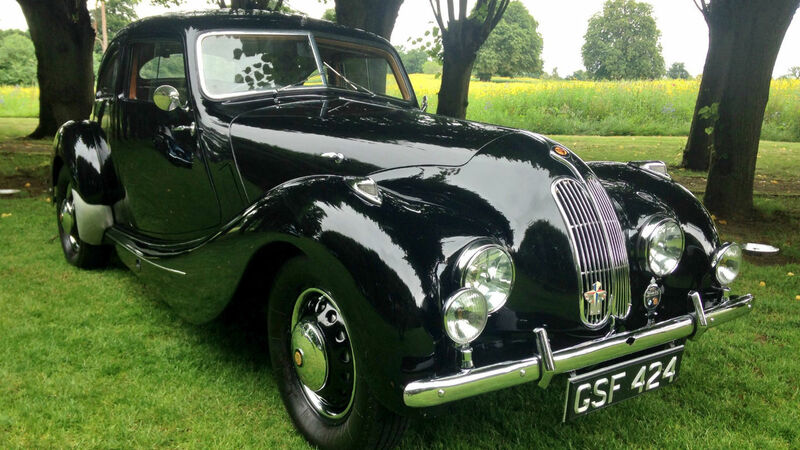 The car was displayed alongside several of the high-points from Bristol’s history – including one of the first 400s. This isn’t quite the finished article, but it’s not far off. Bristol is still fine-tuning some details to meet production regulations. Thankfully, despite ominous grey clouds overhead, the rain steered clear of Bristol’s priceless prototype. That prominent fuel filler is one of the details that will be changed. In production cars, it will sit flush with the bodywork. Thankfully, the voluptuous curves and twin exhausts are staying. 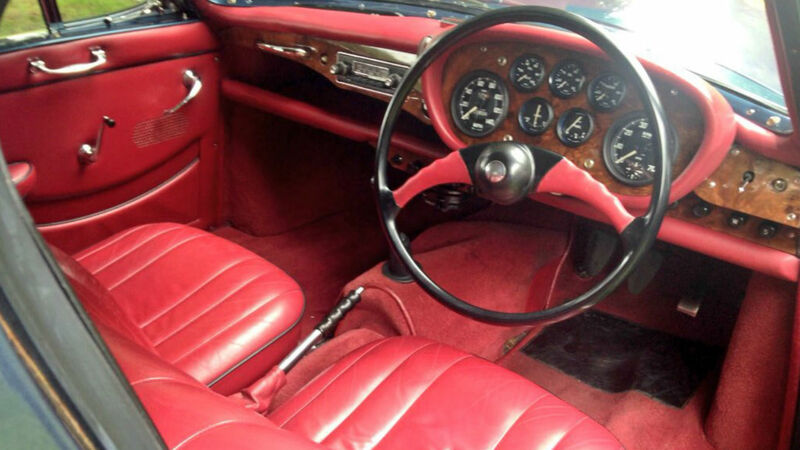 Here’s another glimpse of the Bristol’s rather inviting interior. Note the exposed carbon fibre on the dashboard. ‘Classic wood’ is also an option. The Bullet was swarmed all over by the UK press, before being shipped off to London’s famous Dorchester hotel for a formal premiere. Today, the car really is the star. 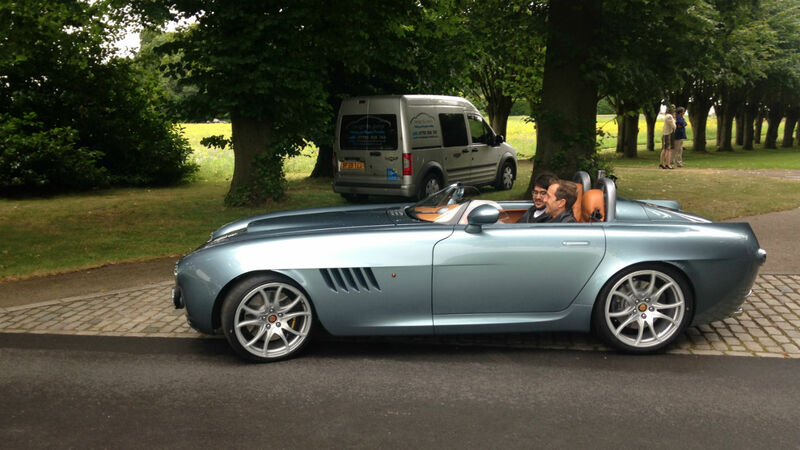 We had a very brief passenger ride in the Bullet around the Coworth Park estate. The engine’s ample torque was obvious – along with its great soundtrack. The ride felt well-damped over various speed humps. 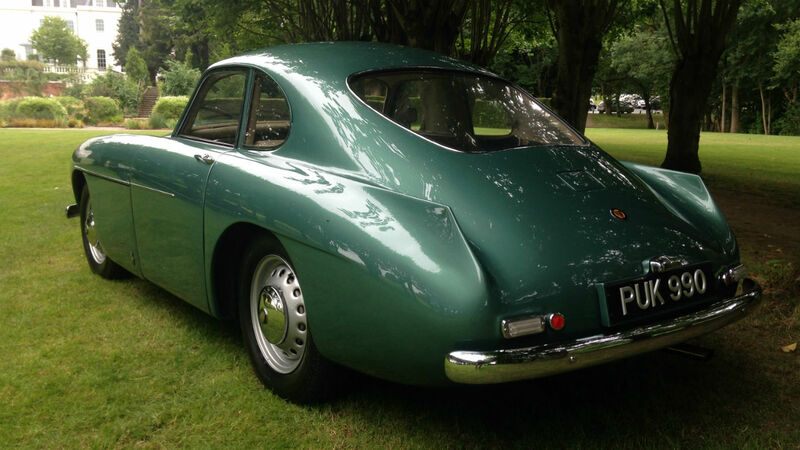 Here’s the car that started it all: the Bristol 400. 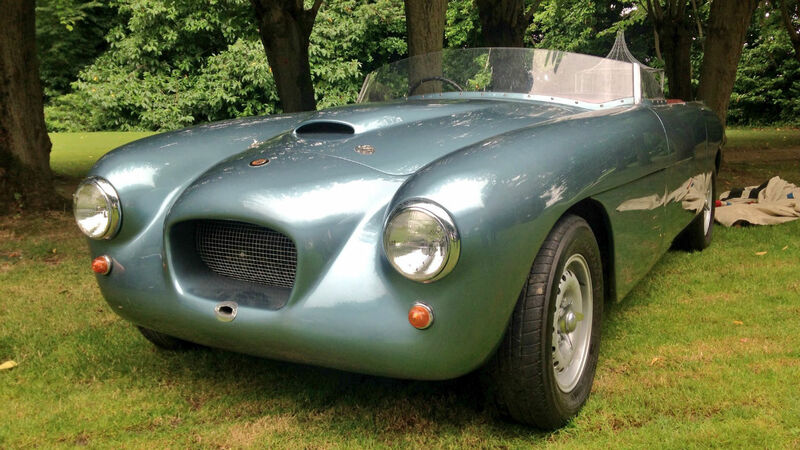 It’s essentially a licence-built BMW 328, hence the oddly familiar kidney grille. 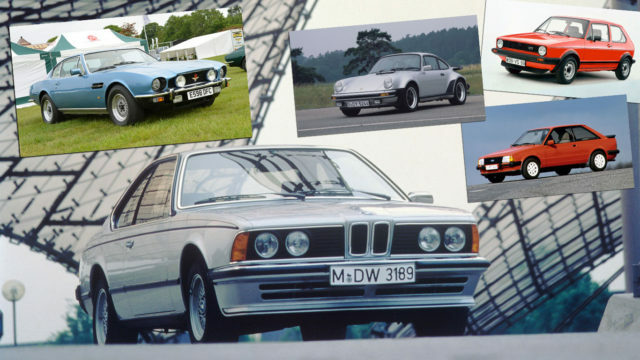 The link between Bristol and BMW persists to this day, as evidenced by the Bavarian V8 in the new Bullet. 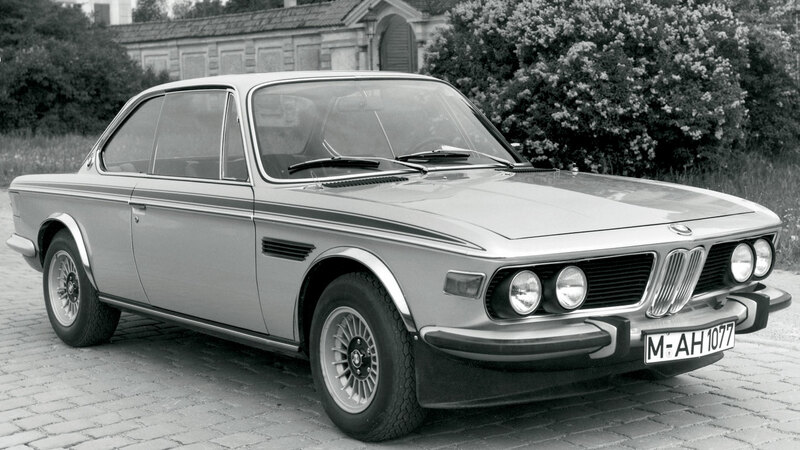 The 400 was no slouch, though – it’s engine actually came from the racing version of the 328. 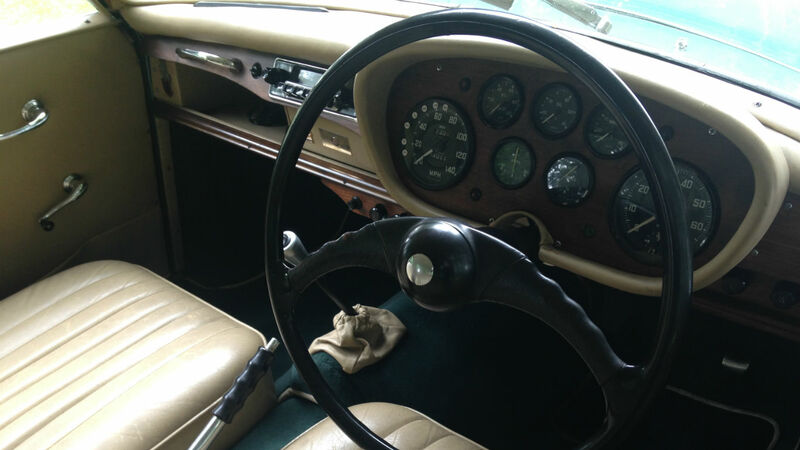 The dials in the the 400 are scattered – seemingly at random – across the dashboard. 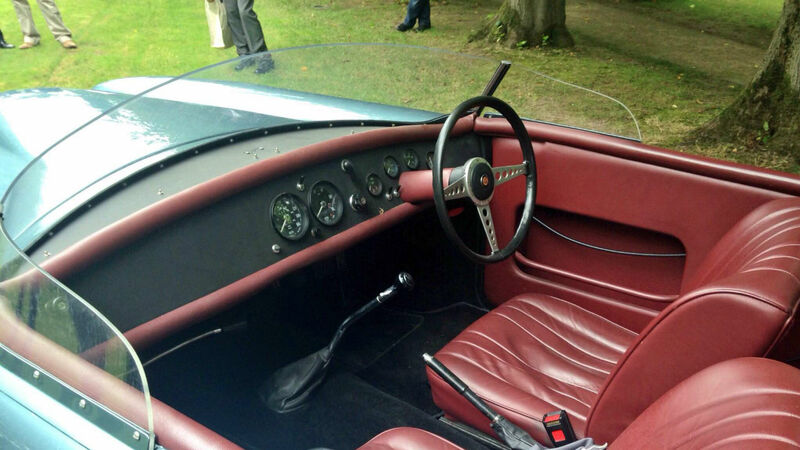 Later Bristols would take their cues from the company’s aircraft heritage, with a more structured and ergonomic ‘cockpit’. Built between 1953 and 1955, the 404 was known as the ‘Gentleman’s Express’. 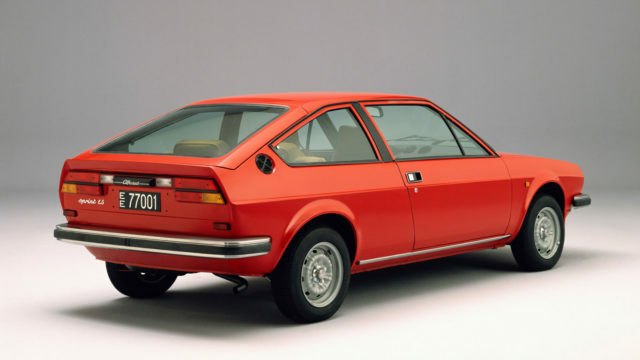 This stylish two-door coupe was impressively aerodynamic for its day – again, influenced by aircraft design. 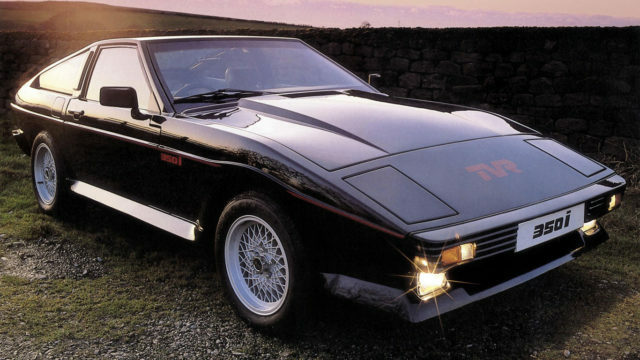 The 404 was powered by a free-revving 2.0-litre Bristol engine. 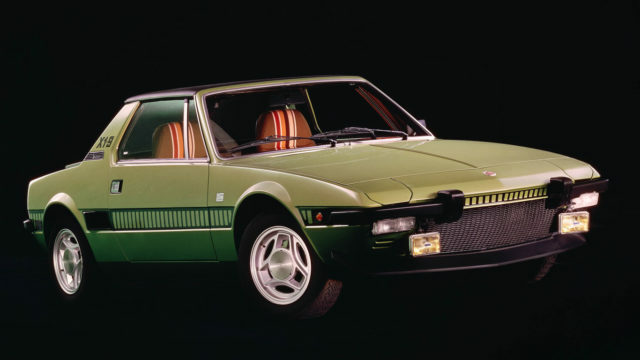 It’s a beguiling, and uniquely British, alternative to Italian grand tourers of the day. Spot the tailfins, also seen on the new Bullet. The 404’s dashboard is much closer to what you’d find in a modern car, with clear, white-on-black dials. And the classic wood-and-leather combo never goes out of fashion. Wow. This soft-top 405 really is something special. 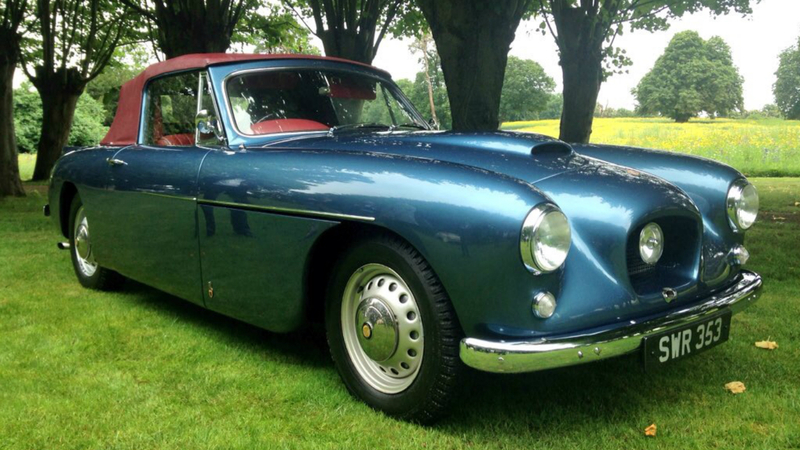 One of just 43 built, its sleek bodywork was designed by Abbotts of Farnham and looks resplendent in deep blue. 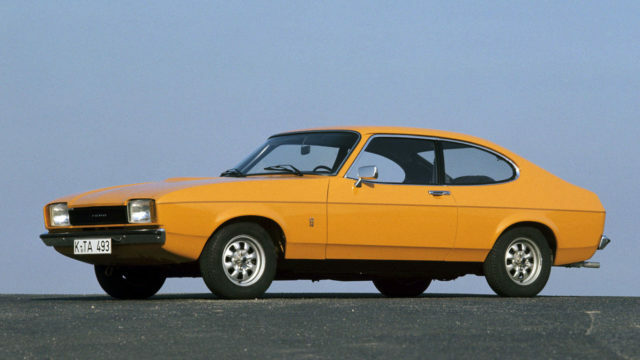 The 405 was first launched as a saloon, which remains the only four-door Bristol ever made. The Drophead boasted an extra 21 hp from its 2.0-litre, six-cylinder engine – bringing its grand total to 126 hp. How inviting does that soft red leather look? The 405’s thin-rimmed steering wheel is still rather bus-like, but its short gear lever offers snappy shifting. Front disc brakes were an option. Lastly, here is the car that inspired the new Bullet. 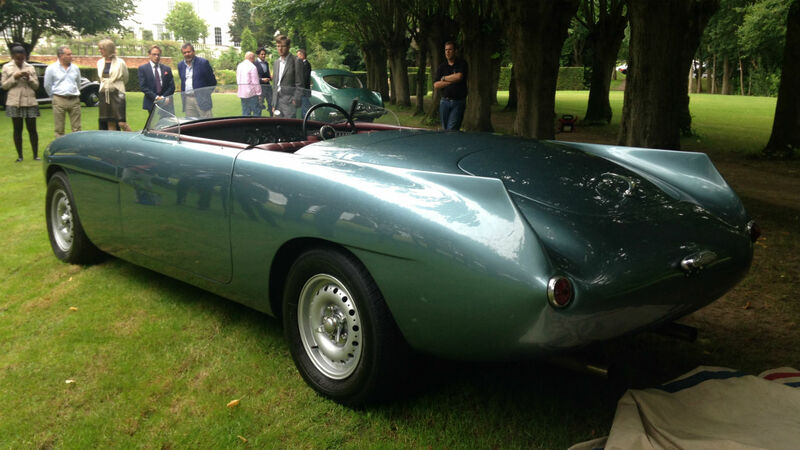 This one-off Speedster was discovered under covers in a dusty corner of the Bristol factory. Details of its past are sketchy, but the ‘Bullet’ nickname has stuck. Looking at the original Bullet, it’s easy to see where the new car got its looks. It’s simple, sleek and utterly gorgeous. 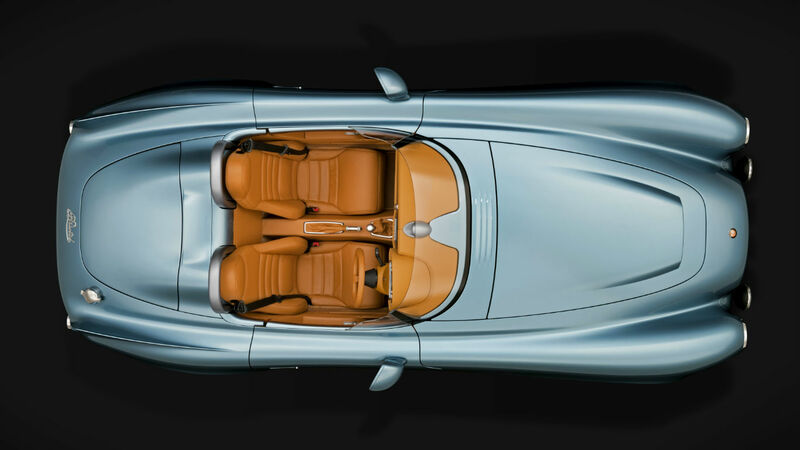 The Bullet might look like a racing car, but its well-appointed interior suggests otherwise. 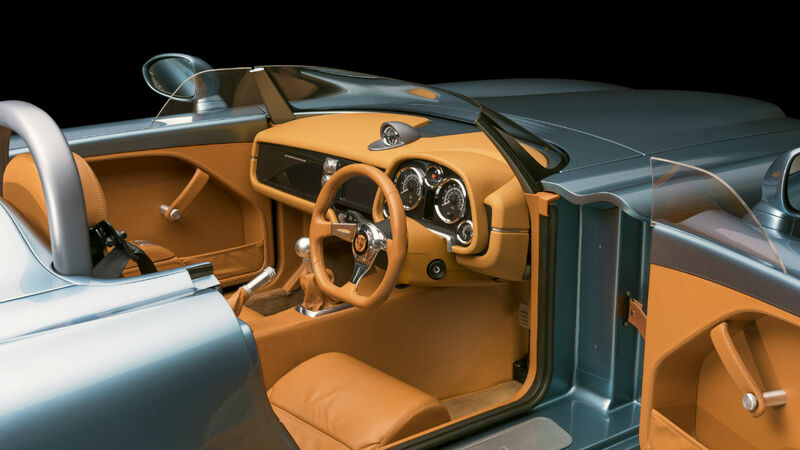 Like the modern car, the half-height windscreen wraps around into the front half of the doors. Good luck getting a replacement from Autoglass for that one. The 2017 Bullet is a confident return for a once-great British brand. We’re not totally sold on the styling, but quality seems very good – and the driving experience promises much. 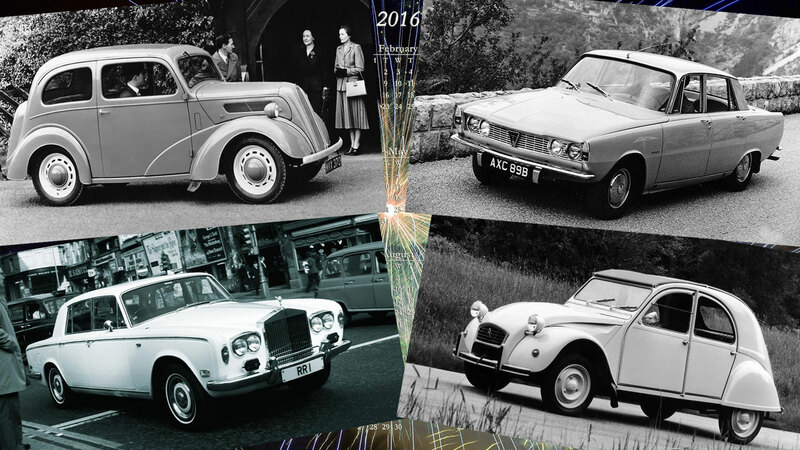 Motoring Research will be getting behind the wheel later this year, so stay tuned for more Bristol news soon. Your first encounter with a car was probably when your parents drove you home from the maternity ward. 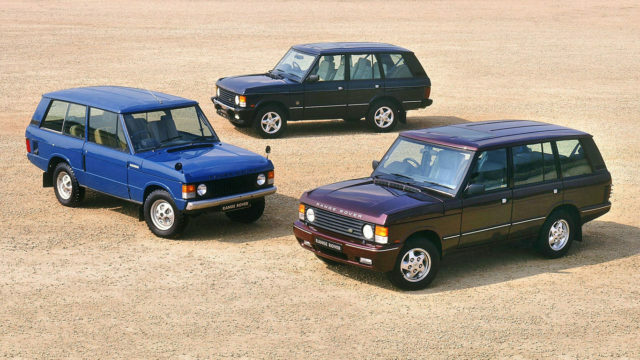 Safe to say you won’t remember much about the journey, but did your folks ever reveal their choice of wheels for this momentous drive? 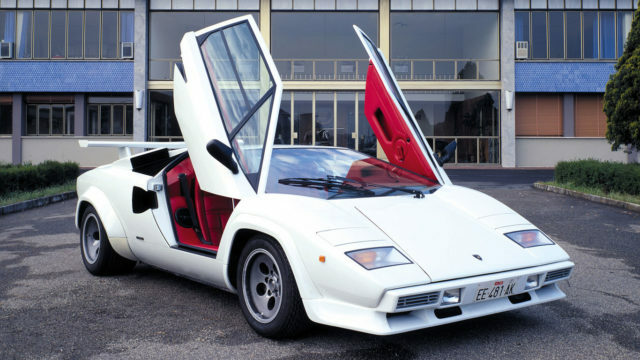 And would would that car cost in today’s money? We’ve crunched the numbers to find out. According to a copy of Motor, October 1948, the Ford Anglia was the cheapest four-wheel car in Britain. In 1950, the Anglia – a descendant of the current Ford Focus – would have set you back £310, the equivalent of £9,888 in today’s money. Although synonymous with the Swinging Sixties, the Mini burst onto the scene in 1959, with prices ranging from £497 to £537. 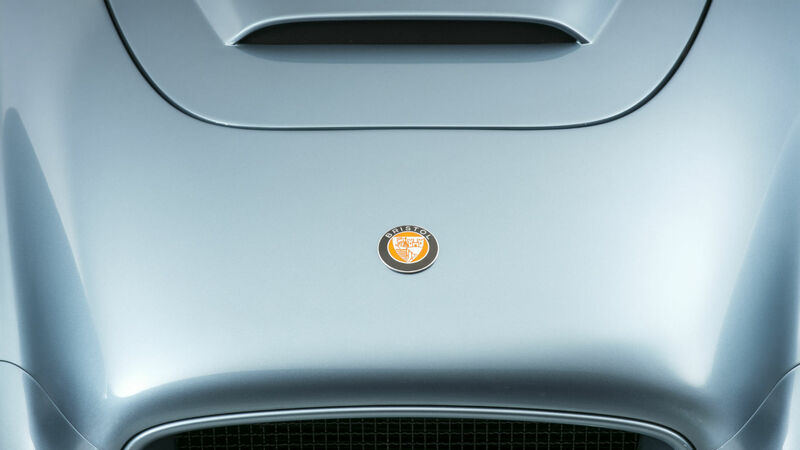 It quite literally changed the shape of British motoring and laid the foundations for a new decade. 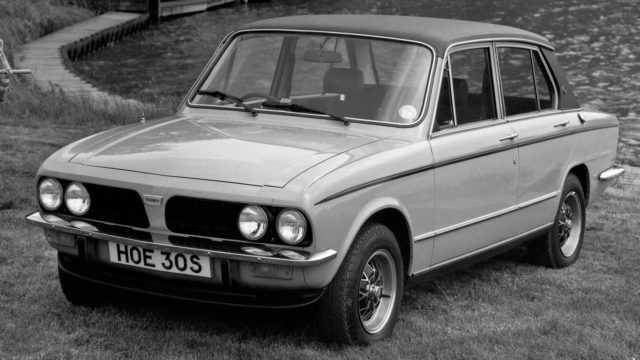 Back in 1964, you could drive away in this super-saloon for £1,100 – about a third of the average house price. Inflation adjusted, that’s a little over £20,000. 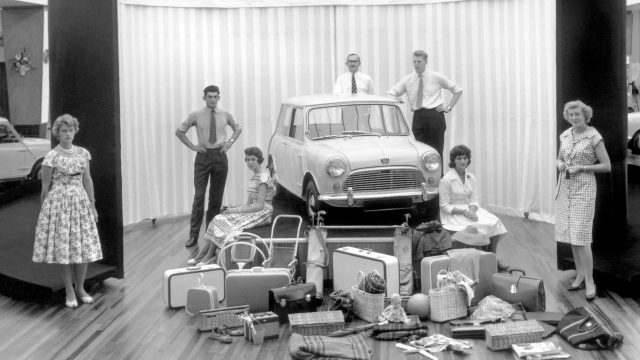 Good luck securing a roadworthy Mk1 Lotus Cortina for that price in 2016. 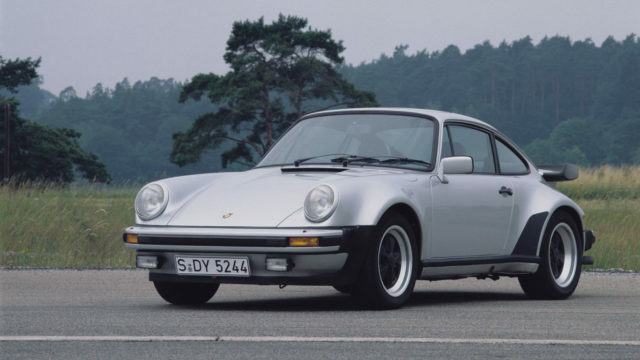 In 1966, as England lifted the still-gleaming Jules Rimet trophy, the Porsche 911 was in its infancy. 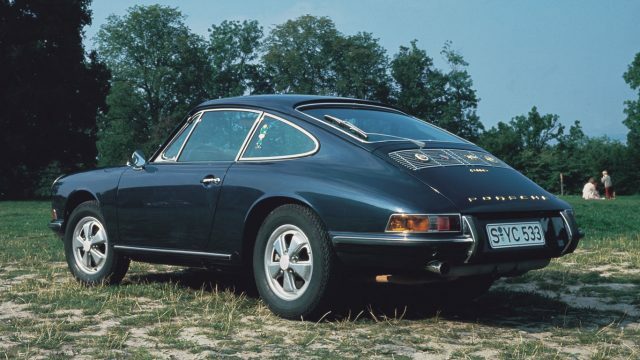 You could have celebrated the Three Lions’ triumph by purchasing a 911 for £3,438 (£60,042 in 2016). Today, you’ll need at least £76,412. 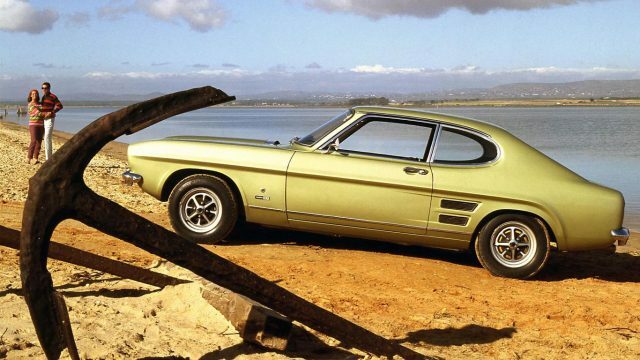 As if to bridge the gap between the 60s and 70s, Ford launched the Capri in 1969. 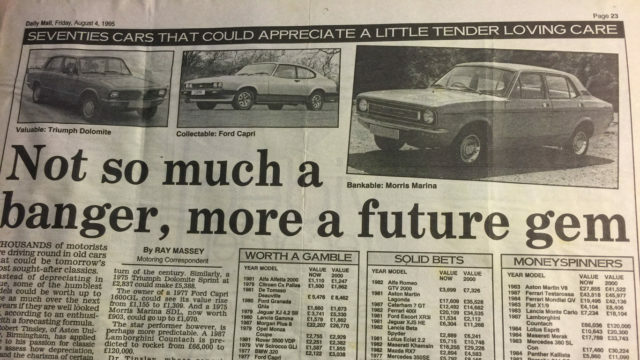 The ‘car you always promised yourself’ became a firm favourite of the 1970s, not least because of its low price. Just £890 for the ‘European Mustang’ – what a steal. 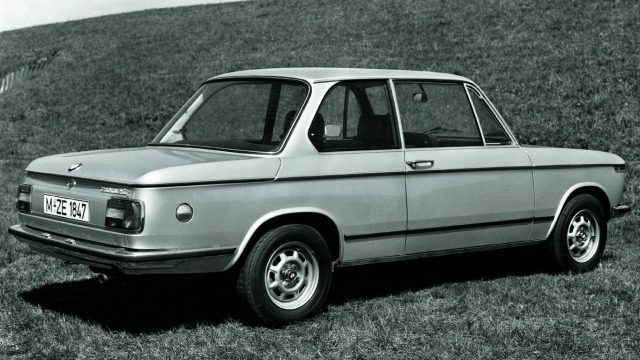 The rather brilliant BMW 2002 Tii cost an eye-watering £3,659 in 1975 – the equivalent of £34,431 in 2016. That’s more than the price of a new BMW M140i. Oh, Rover, where did it all go wrong? Actually, that’s a rhetorical question, because its demise has been well documented. In 1988, the not-so-small matter of £19,944 could get you behind the wheel of the fastest road-going Rover: the 800 Vitesse. 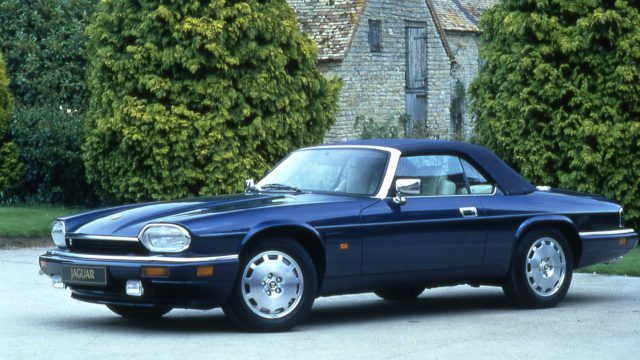 Check out the price of a Jaguar XJS 4.0 Convertible in 1992. At just shy of £40,000, it was about two-thirds of the average house price. Expensive? At £77,284 in today’s money, that’s more than a Jaguar F-Type S AWD. Check out the launch price of the Porsche Boxster. At £33,950 it sounds good value, but inflation adjusted that results in a figure of £57,510. That’s not cheap, especially when you consider the average house price in 1997 was £76,103. 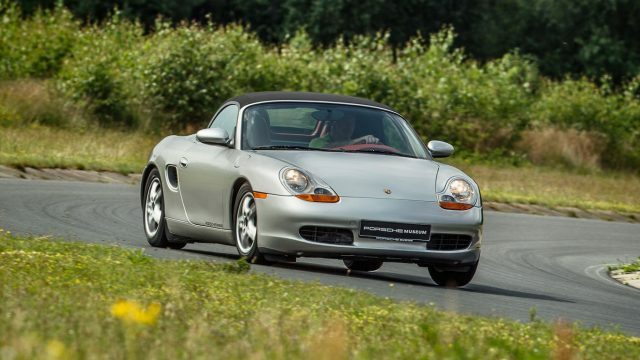 We should also point out that an entry-level 718 Boxster could be yours for a mere £41,739.